We would like to thank you for purchasing Express! We are sure that you have made an excellent choice in selecting it. You also have agreed that this item is unique among tons of Premium WordPress themes. 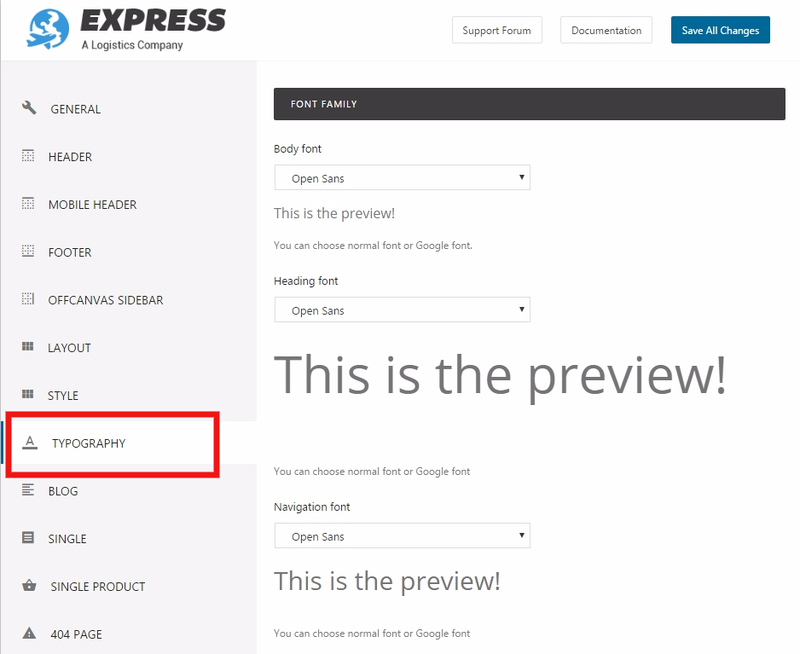 Before getting started, please make sure that you always check out our Express WordPress Theme documentation files. We offer all kinds of useful information that you need to use for your purchased item. Besides, Knowledgebase, Articles, Forum Search in our Free support center are available for you to fully satisfy your questions. Thank you, we hope yo u enjoy our theme. 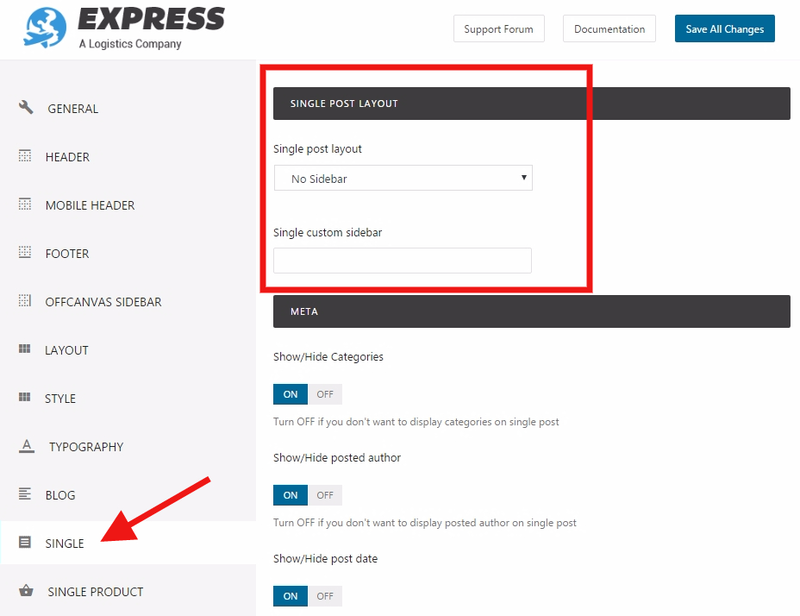 Express can only be used with WordPress and we assume that you already have WordPress installed and ready to go. If you do not, please follow the below WordPress information section to see our section on WordPress to help you get started. WordPress general - General information about WordPress how to install it on your server. First steps with WordPress - A detailed document with many topics about how to begin WordPress. WordPress FAQs - Providing answers to the most popular questions about WordPress. To use Express, your server must be running WordPress 4.3 or higher, PHP5.5 or higher, and mysql 5 or higher. Below is a list of items you should ensure your host can comply with. Please make sure that your server has the minimum requirements to run WordPress at least. You can download the latest version of WordPress from offical WordPress from offical website. 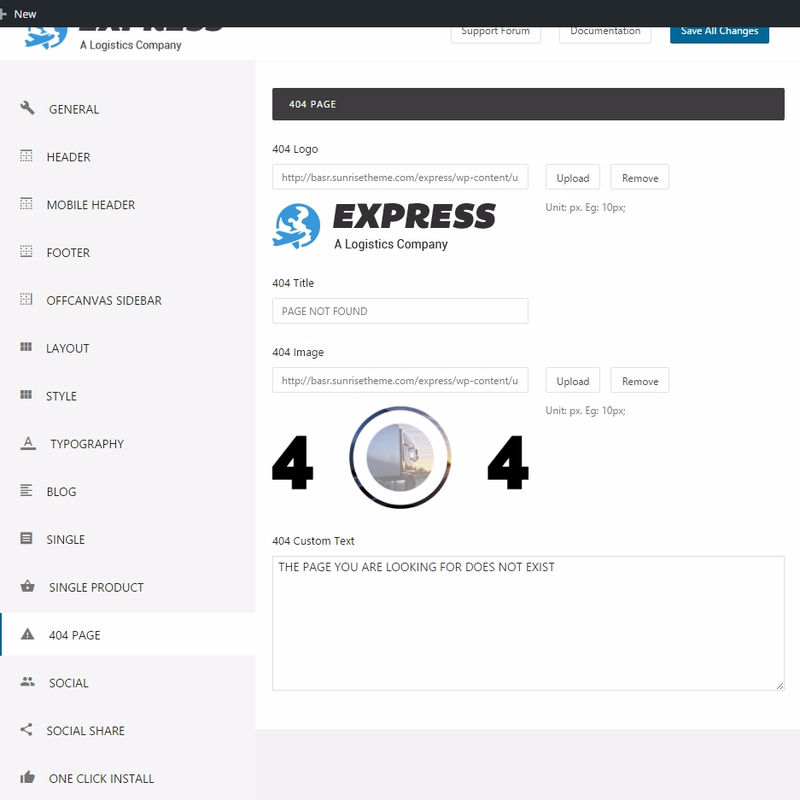 When you purchase Express, you need to download our theme package on from Themeforest. 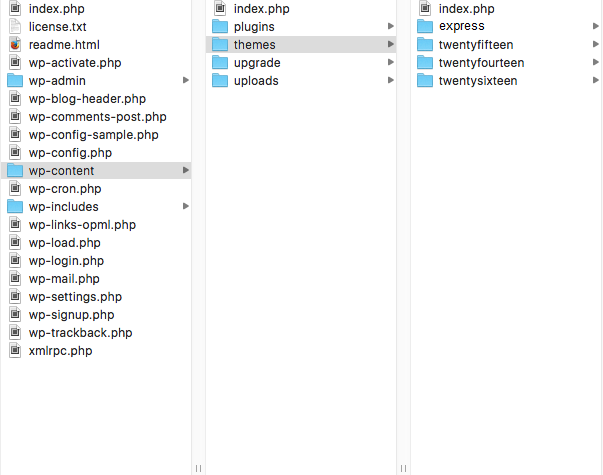 Extract our full package, then you will see all the files and folders, including 02 .zip files and 03 folders. Below is a full list of everything that is included when you download our theme, along with a short description of each item. Sample-Data folder - Contains 01 .xml file and 01 .zip file. 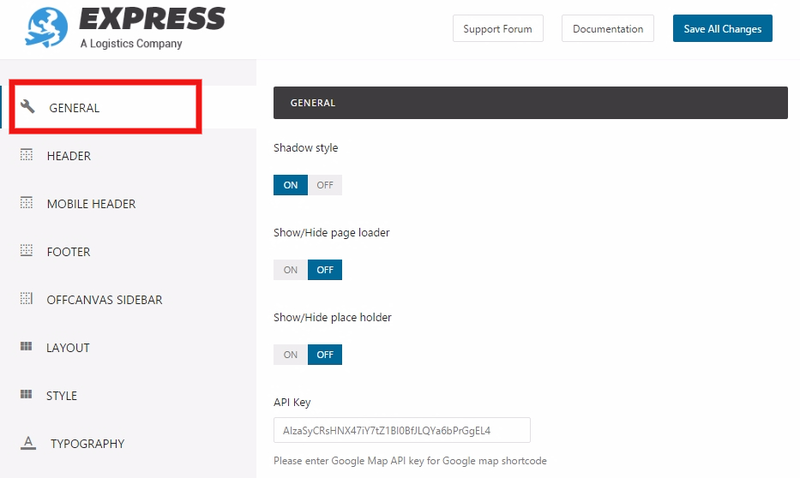 Following some steps below, you can completely install Express in few minutes. Step 3: Click to Upload >>> Select installation files, choose Express.zip. 1. Are You Sure You Want To Do This? If you get the “Are You Sure You Want To Do This” message when installing Express via WordPress, it means you have an upload file size limit. Install Express via FTP if this happens, or call your hosting company and ask them to increase the limit. You may try modifying the existing .htaccess file in the root directory or creating a new one. 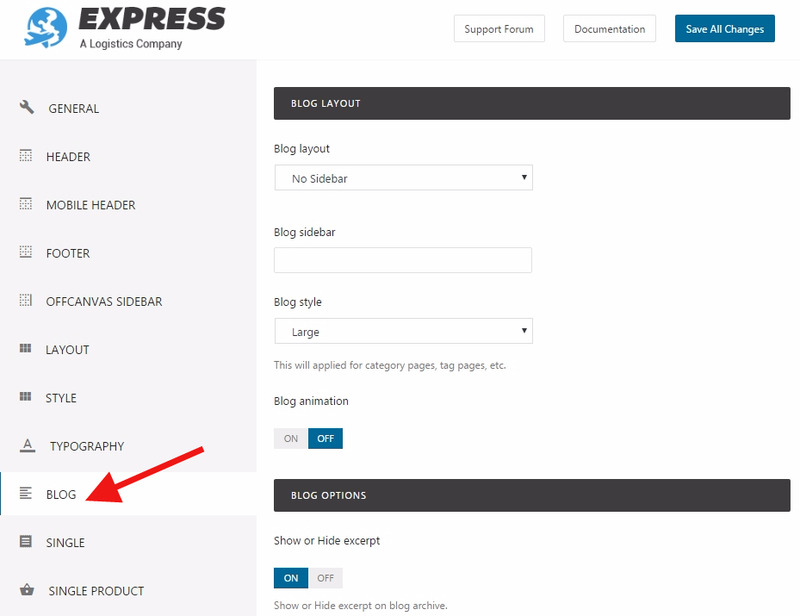 Step 3 – Upload the extracted Express theme folder into /wp-content/themes/. Images - Our demo images are not included because they are licensed stock items that are not allowed to be shared. So, they will be modified by placeholders, you need to contact authors to get permission in case you want to use them in your commercial or non-commercial projects. This is the second way for you to import our demo content. Continue reading below to learn how to manually import demo content. Make sure you have installed all recommended plugins before importing sample data. Express.wordpress.xml All Data - sample demo data of some pages from our demo. The import process may take several minutes due to large data and your server capacity. If your server setting "Max Execution Time" is too low, increase it (as your hosting provider). Please do not close the browser until it finishes. If it fails, you can run this process again until seeing the "Success Message". Feature images are not imported (We use licensed photos on our demo page). Instead you will see placeholder images. Step 4 - When you see the message "All done. Have fun! ", you will know that the import process is done. Note: you may need to re-import the second time if the data is large. NOTE: You can get the .xml file by going to Tools >> Export >> Choose file and click "Download Export File". In the screenshot above, we have exported all content demo data. Then we got the file named "content-export.xml"
Step 3: After clicking to Header tab, you scroll to the bottom of page - Logo section and upload your logo. Please use jpg, jpeg, png or gif image for best performance. Step 5: If you want to make retina logo, you can use a big logo (2x times your regular logo dimension.). Step 6: There are also options to choose alignment of the logo, and adjust the left, top logo margins. This allows you to fine tune the placement of your logo. Step 7: Click to Save all changes and see them on front-end. (1) You can resize it by navigating to Appearance >> Theme Options >> Header >> Headers Section. Then move your mouse pointer to the space between two blocks. If the logo block was too small, you need to resize it until you satisfy with the result. (2) Also, don’t forget to adjust the padding size in “Logo Margin” of Theme Options. That is also the reason causing the logo’s narrowing. The final way to resolve this problem is to have some code knowledge to be able to edit the height of header section. Iphone icon - The iPhone icon is a file used for a web page icon on the iPhone. When someone bookmarks your web page or adds your web page to their home screen, this icon is used. If this file is not found, these products will use the screen shot of the web page, which often looks like no more than a white square. Iphone retina icon - The same as iPhone icon but for Retina iPhone. Ipad icon - The same as iPhone icon but for iPad. Ipad retina icon - The same as iPhone icon but for Retina iPad. 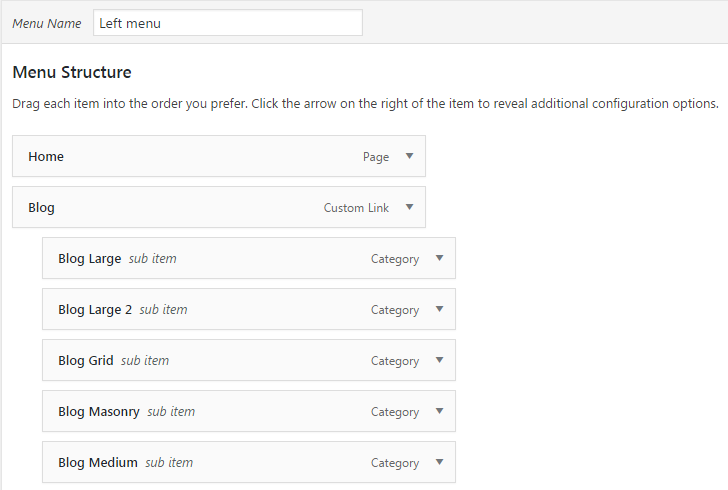 Step 6: Click to Save menu button once you have added all items you want to menu. 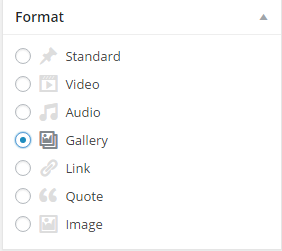 Gallery format: add images, audio, video... from gallery. Gallery auto play: True or False. If you choose True, your gallery will play in auto. Default is False. Gallery duration time: fill duration time for your gallery. Default is 5000. 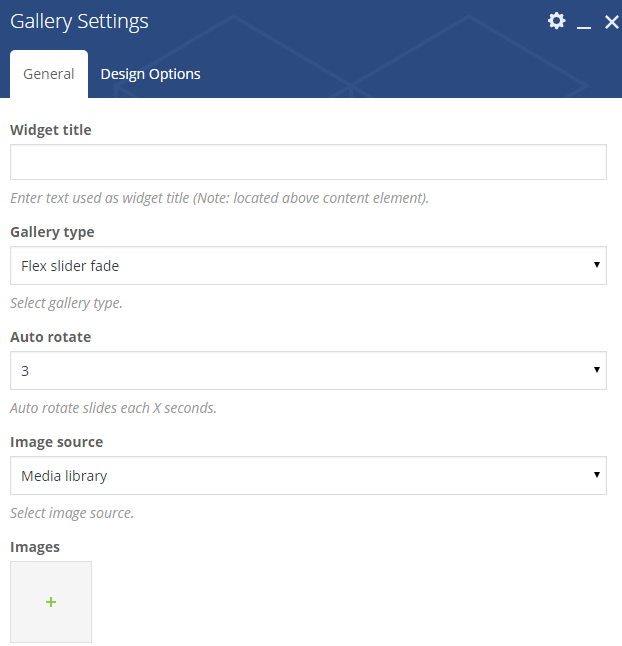 Gallery speed: custom the speed. Default is 300. Gallery pagination: True or False. If you choose True, your gallery will be paginated. Default is False. Gallery navigation: True or False. If you choose True, your post will have gallery navigation. Default is True. Gallery mousewheel using: True or False. If you choose True, the gallery can be used by mousewheel. Default is True. Video source: Select video source: video link, upload local file, video embed code. Audio source: Select audio source: soundcloud link or upload local file. Soundcloud format URL: Insert soundcloud link, or link audio from other websites (option for format "Link" only, please fill in full http:// address). Quote author: Fill the author name of the quote. Author quote URL: Add author link. Quote content: Fill the quote. Step 3: You will see that all categories of posts you have created. Step 4: Click to any category you want to. For example "Game Online". 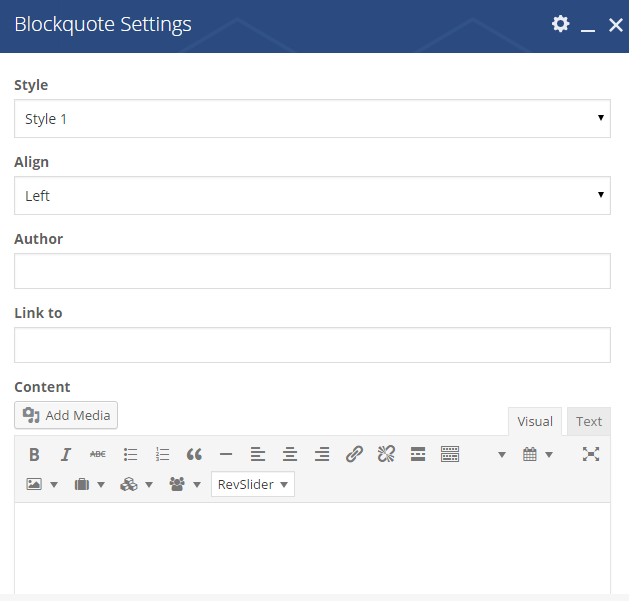 Here, you can select Blog layouts such as Right sidebar, Left sidebar, No sidebar, choose Blog styles including Large, Large 2, Masonry, Grid, Medium for your blog listing. Step 5: Go ahead, scroll to "Background for blog taxonomy" to know more details. 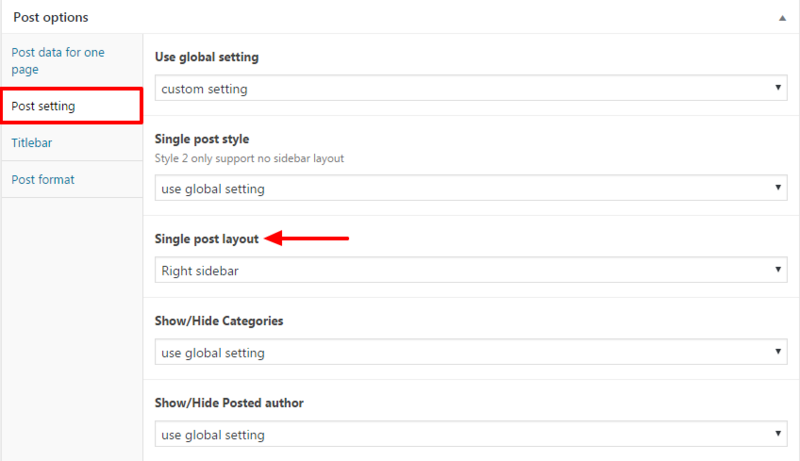 Blog layout: You can select the position of sidebar for your blog page including right sidebar, left sidebar, no sidebar or use global setting. 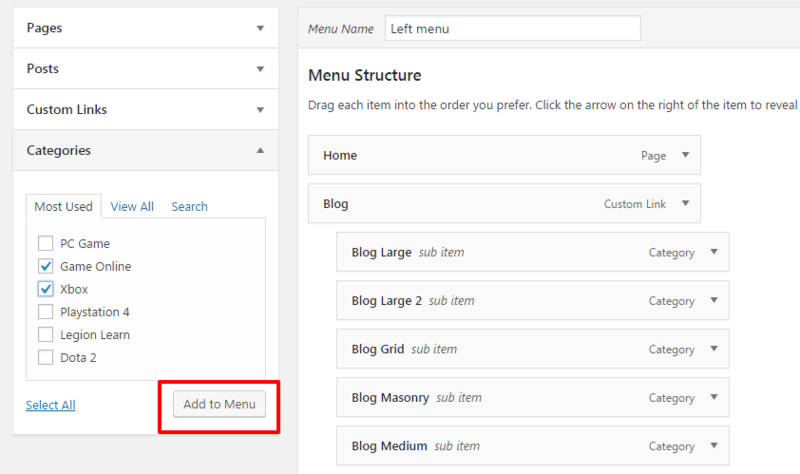 Blog column: If you select Grid or Masonry style, then you can select the number of blog columns including 2-4 columns. Blog titlebar image: Allow you to upload the image as titlebar background of blog listing. The with of background image should be 1920 or larger. 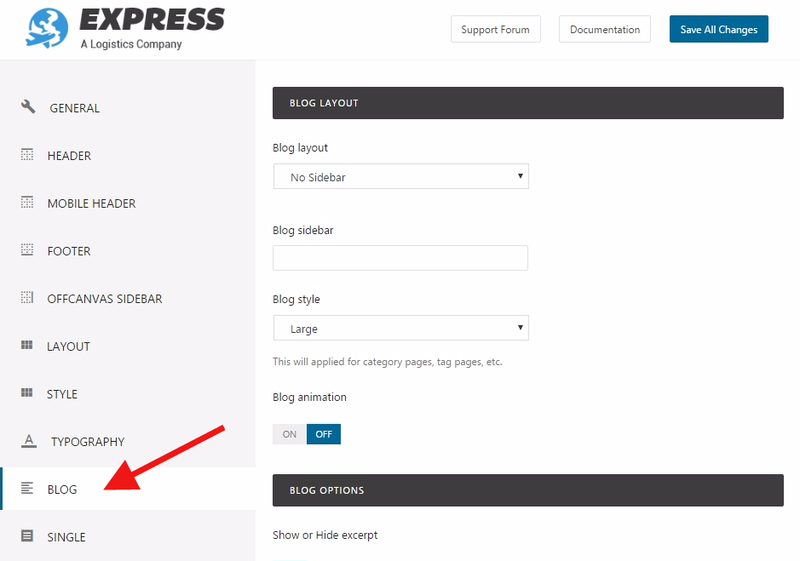 To setup for your blog page, please go to Theme Options and follow the below steps. All the changes that have been made in this 'Blog' section of Theme Options will effect the entire website. That means if you make any adjustments in a certain page, it will overwrite options in Theme Options. Blog style: There are 05 styles icluding large, large 2, grid, masonry, medium. 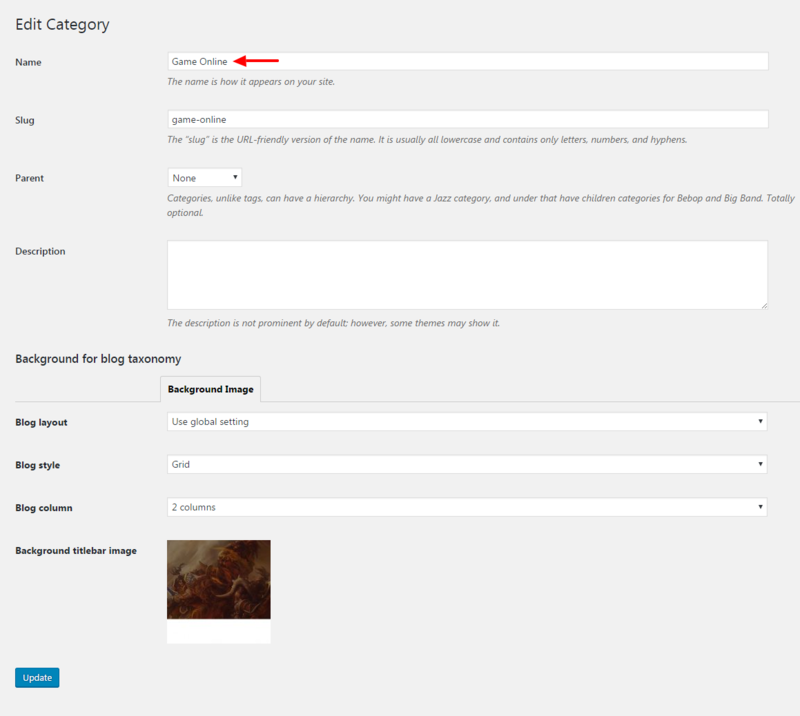 Fullwidth: Enable full width layout for masonry blog. Categories titlebar background image: Allows you to upload background image for the titlebar of blog category listing. 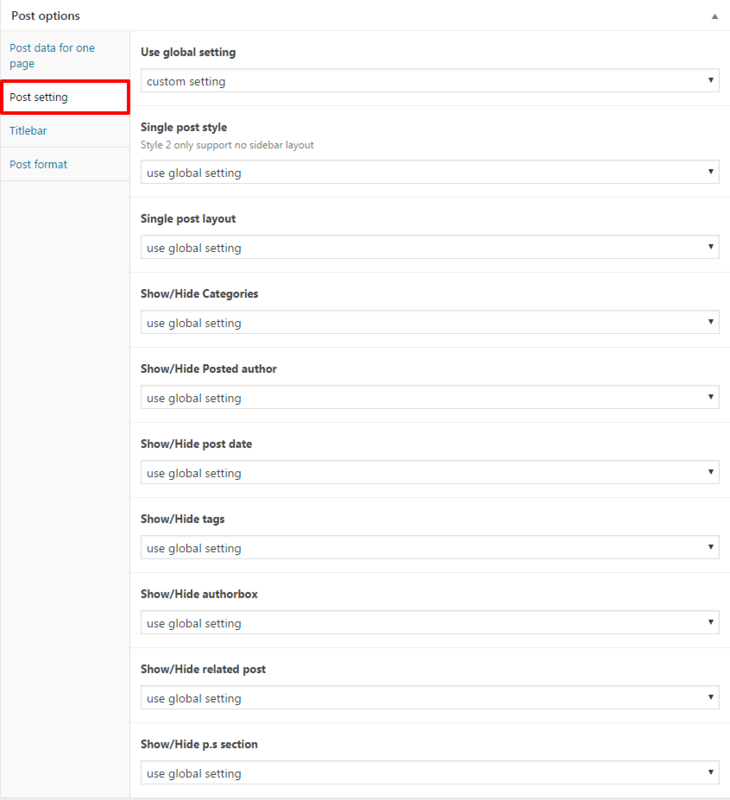 Step 0: Make sure you created two new pages in WordPress (under Pages >>> Add new), and publish them. For the purpose of example, we’ll call these “Home” (for the front, or Home, page) and “Blog”. 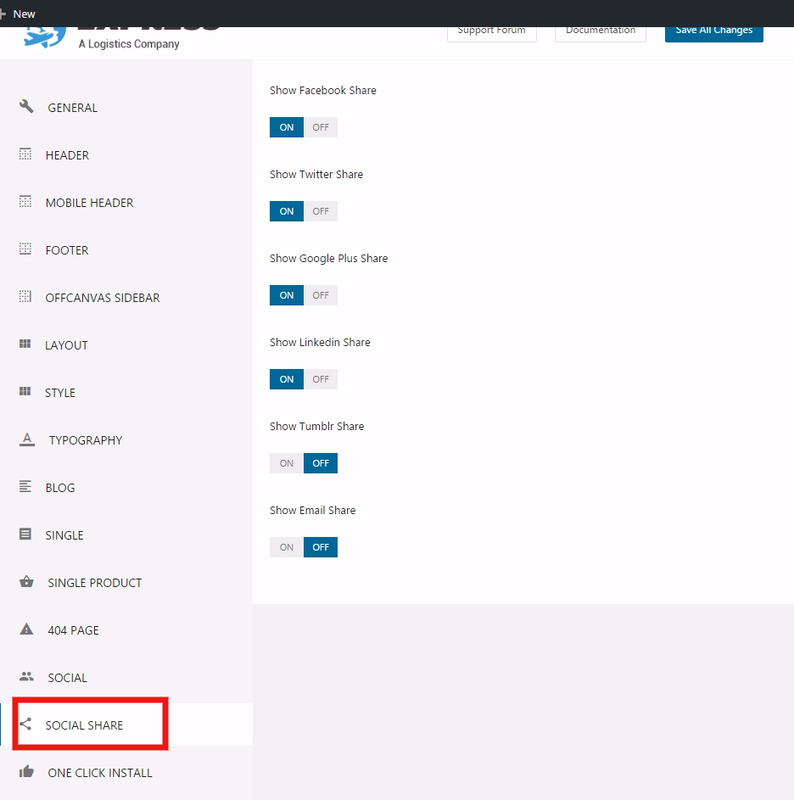 Step 2: Set "Front page displays" to a "Static Page"
Search: You can also add more icons to Top Navigation such as Text Editor, Social, Widgets, Canvas Sidebar, Woocommerce Cart, Logo, Custom Menu by navigating to Theme Options >> Header. Then scroll down to "Middle Header Section". Page Content:This section of a web page plays the most important role partly because it contains visual block, content, image, video, which are built by shortcodes in Visual composers or codes. It also occupies the largest part in a web page. Copyright text:This copyright text is in the footer of web page. You can go to Appearance >> Theme Options >> Footer. Then scroll down to the 'Footer copyright text'. 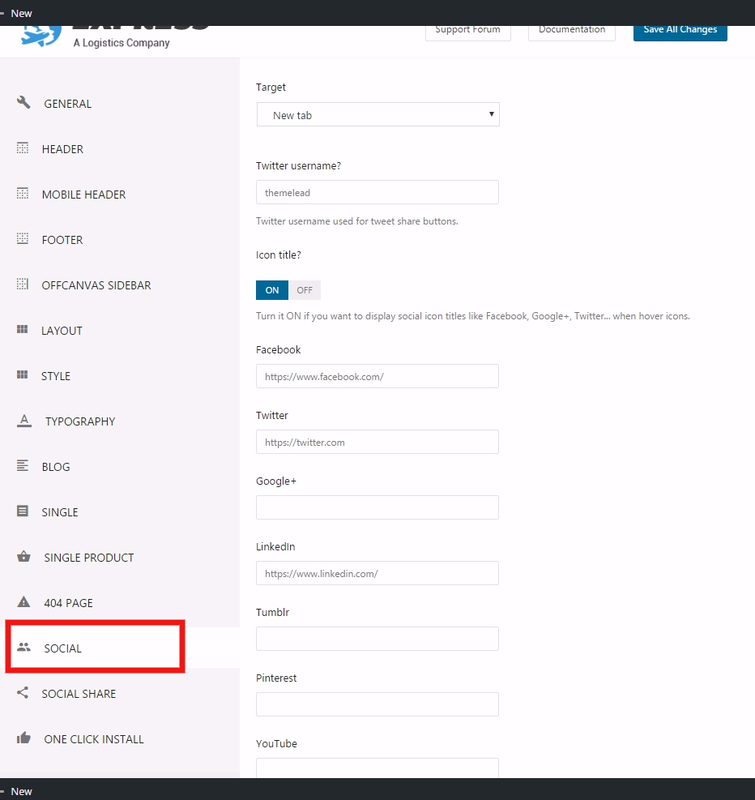 Social Accounts: To customize all the social links in page bottom, you can go to Appearance >> Theme Options >> Social and then change the links. All the changes that have been made in this 'Header' section of Theme Options will effect the entire website. That means if you make any adjustments in a certain page, it will overwrite options in Theme Options. Step 2: Select Header style. 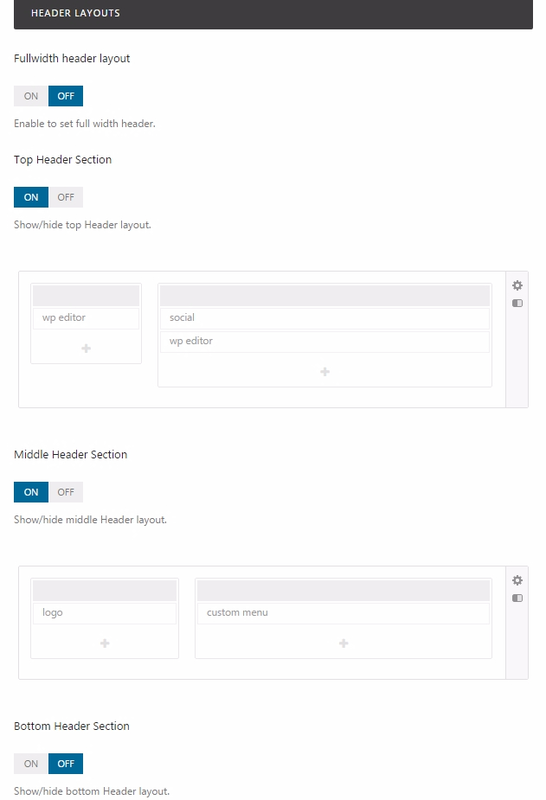 Header style you selected will be applied for all pages on your site. Sticky menu: Sticky, or fixed, navigation is basically a website menu that is locked into place so that it does not disappear when the user scrolls down the page; in other words, it is accessible from anywhere on the website without having to scroll. Smart sticky menu: Turn ON to enable smart sticky menu, it will always stay in your page when scrolling to top and disappear when scrolling down. 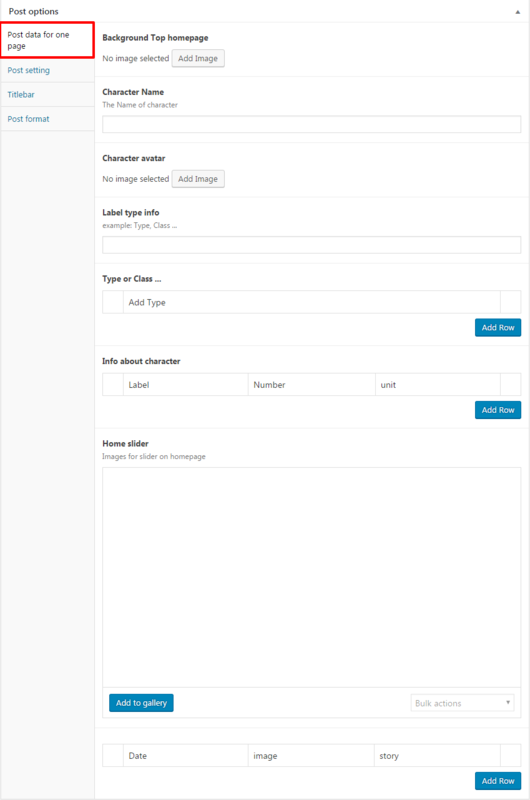 Step 3: In "header layouts", you can set max width for full-width header. To use full-width header, you turn ON to enable it. Step 1: Navigate to Appearance >> Theme Options >> Choose Footer tab to display Footer options. 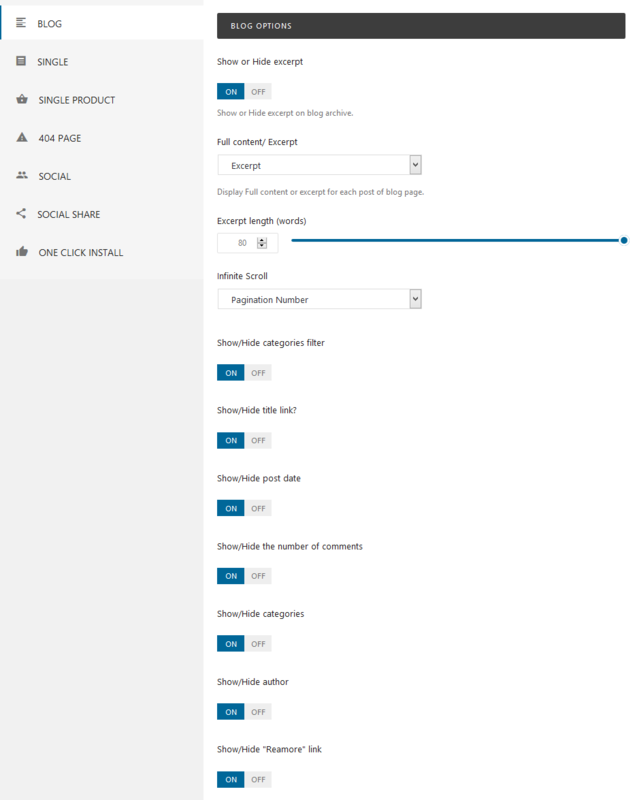 Step 2: There are seven Footer Sidebar Layout options for you selecting. See changes when you select different types of Footer Sidebar Layout at Front-end Settings Below. 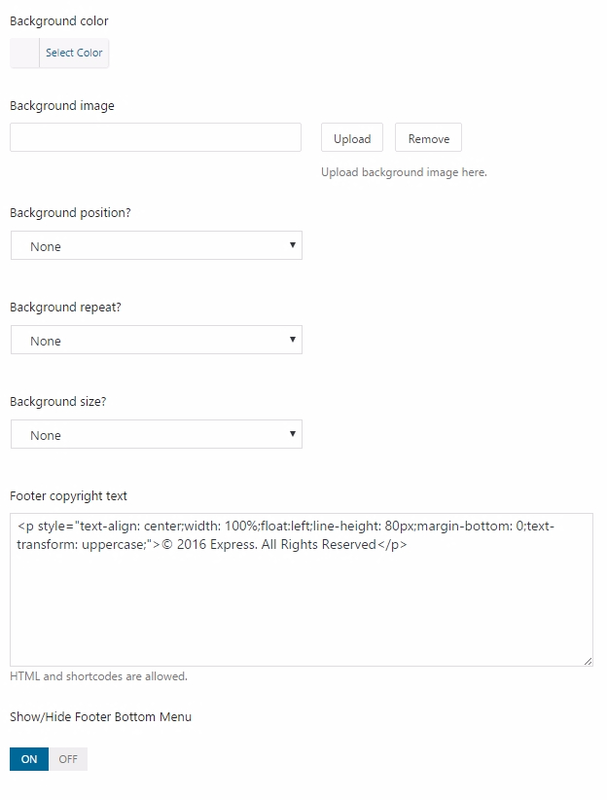 Step 3: You can setup Footer background image by uploading an image file. 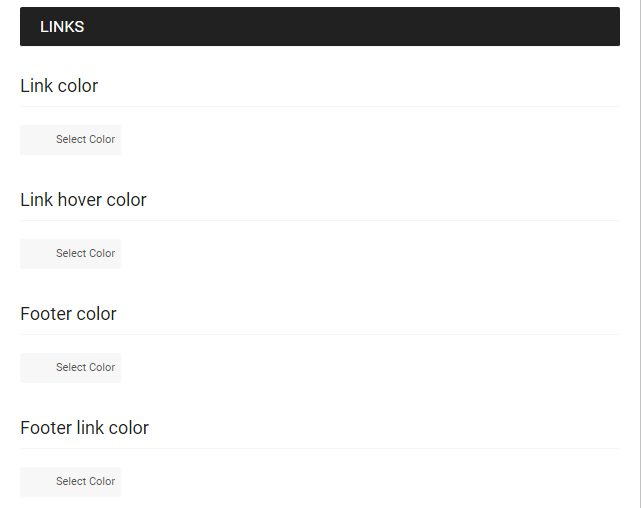 Step 4: To select Footer background color you click to Select Color, choose any color you want to. 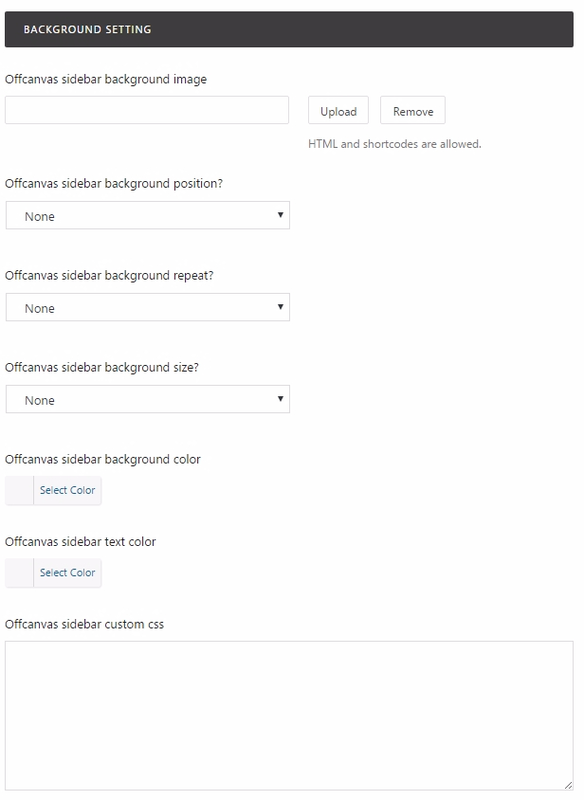 Step 5: There are also options to choose Footer Background position (left, right, center, top or bottom), Footer Background repeat, Footer Background size. 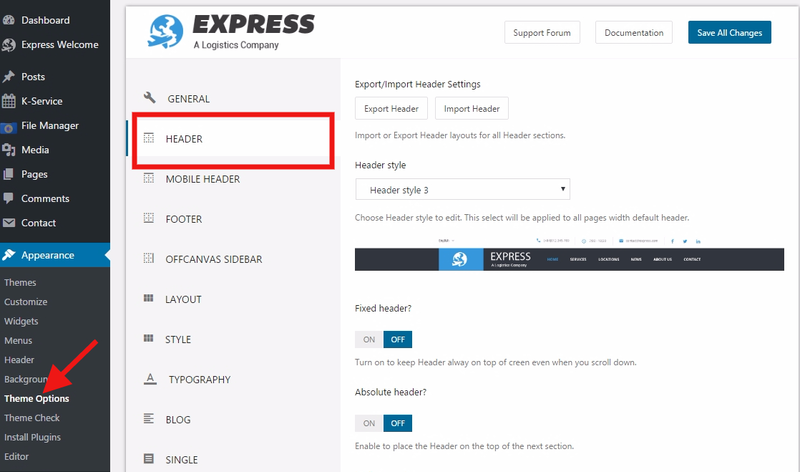 Express footer consists of the widget area and the copyright area. 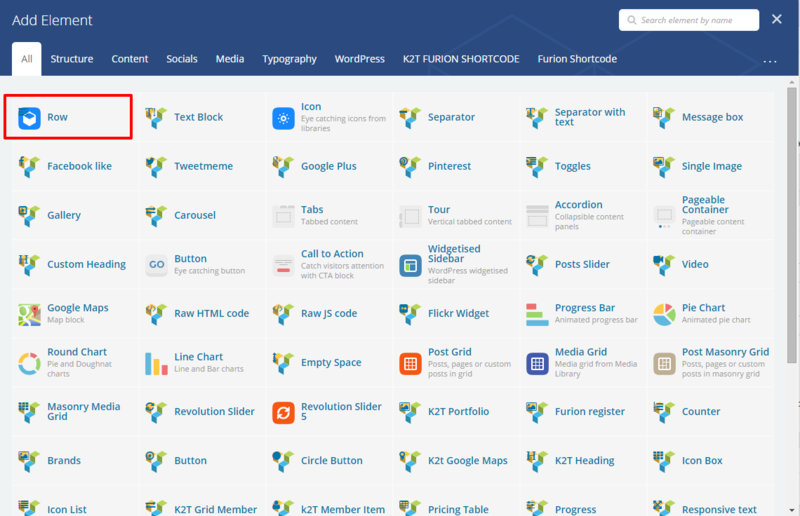 Both of these areas can be configured in theme options on the Footer tab. 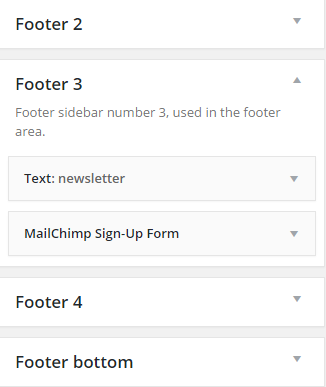 The widget area permit you to select to show 1, 2, 3 or 4 columns in the footer sidebar layout option, you can see some changes when you select different types of footer sidebar layouts. 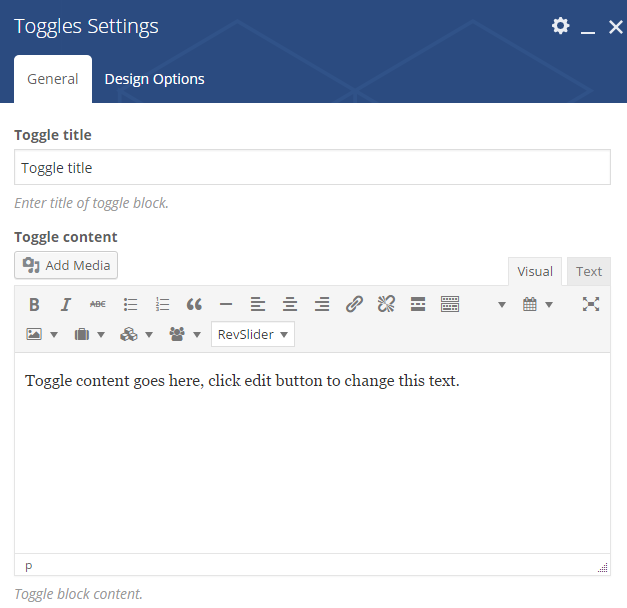 Step 1: Navigate to Appearance >> Theme Options >> Choose Footer to display Footer options. Step 2: Copyright area, you will enter information into Footer copyright text area such as product name, author, year. Step 4: Footer Right Bottom area is to display social networks, by turning On to enable social networks you want to display. 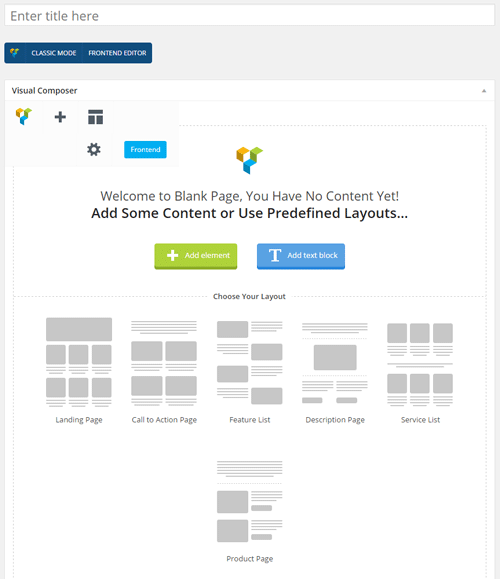 To customize the appearance of your site, you go to Appearance >>> Theme Options to configure. Below is the detail of how to use those functions. Step 1: Navigate to Appearance >>> Theme Options >>>General. 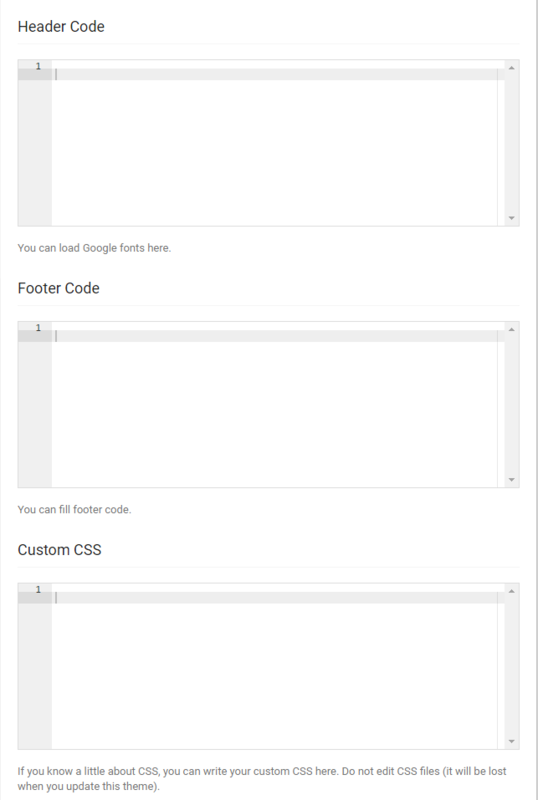 Step 4: For Header code, Footer Code, custom CSS you can enter custom CSS or fill Google Analytics tracking code. Favicon - Favicon is a small icon image at the topbar of your browser. Step 1: Navigate to Appearance >>> Theme Options >>> Offcanvas sidebar. Step 2: Check ON to show Offcanvas. 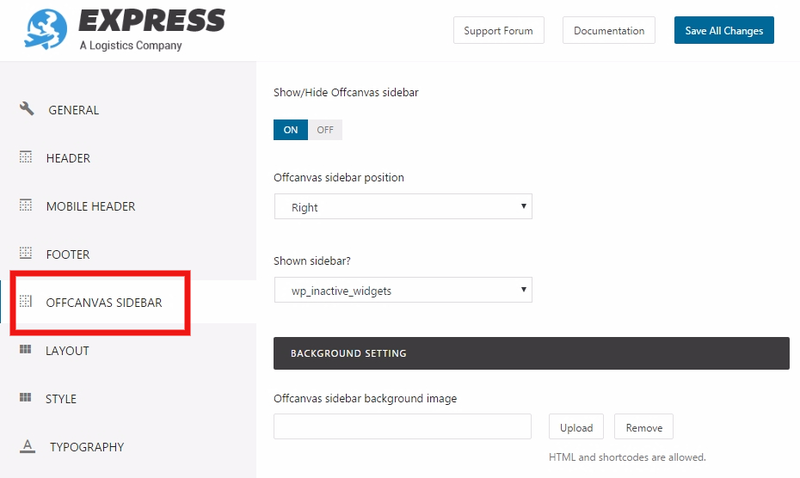 Select the offcanvas sidebar position (left or right) and choose one of the sidebars you have created in Appearance >>> Widgets. More details, you can see Sidebar section in How to section. 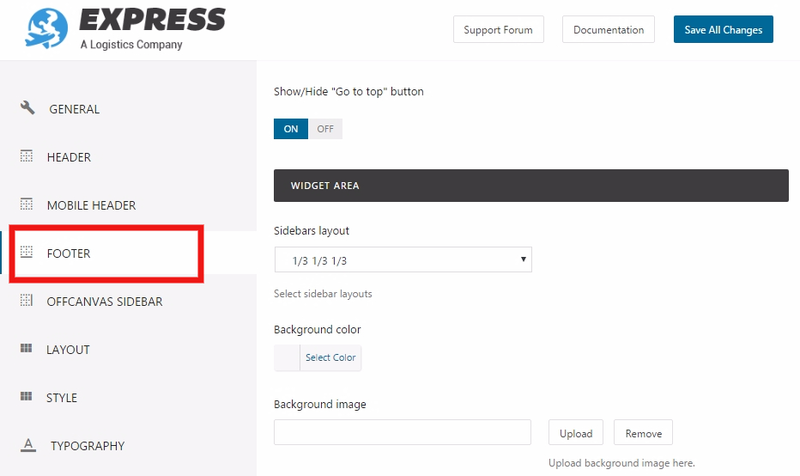 Step 3: Besides, Express allows you to select Offcanvas sidebar background image, background repeat (No repeat, Repeat X, Repeat Y), background size (Auto, cover, contain), background color, text color, custom css. Step 1: Navigate to Appearance >>> Theme Options >>>Style. Step 2: Primary color: Select color for site in primary color (main color), select color for heading and text. Step 3: Link color: You can select color for link, link hover, footer text and footer link. Step 4: Menu color: You can set color for main menu and submenu. Step 1: Navigate to Appearance >>> Theme Options >>>Typography. Step 2: You can choose a normal font or Google font for Navigation, Heading and Body. In this section, you can customize Font size for Heading types or Body. 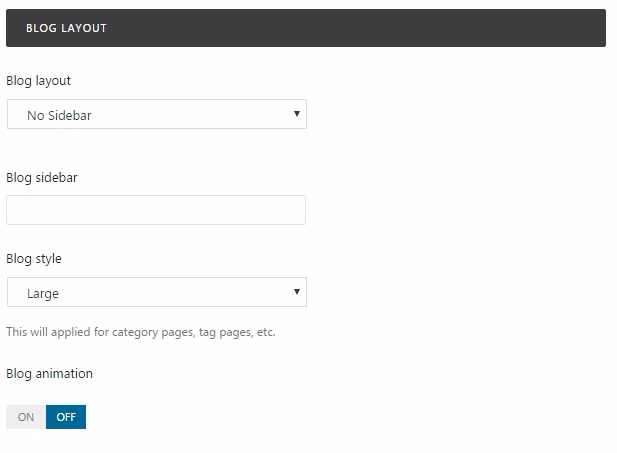 This is all settings for blog category page. 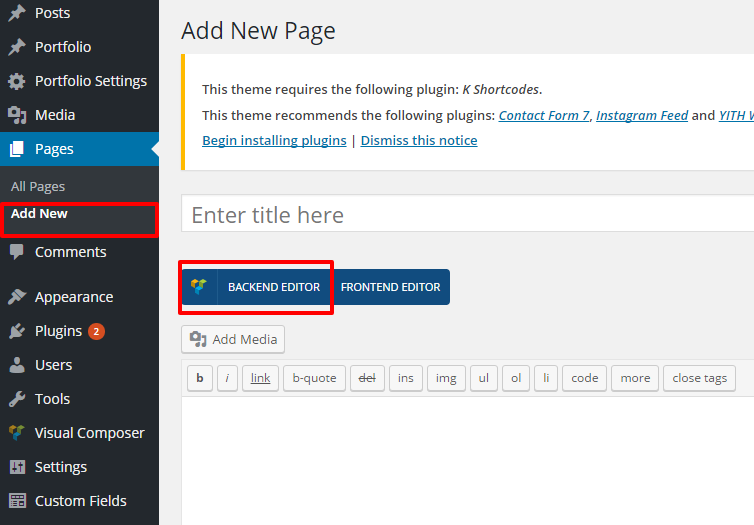 All the changes that have been made in this 'Blog' section of Theme Options will effect the entire blog category page. 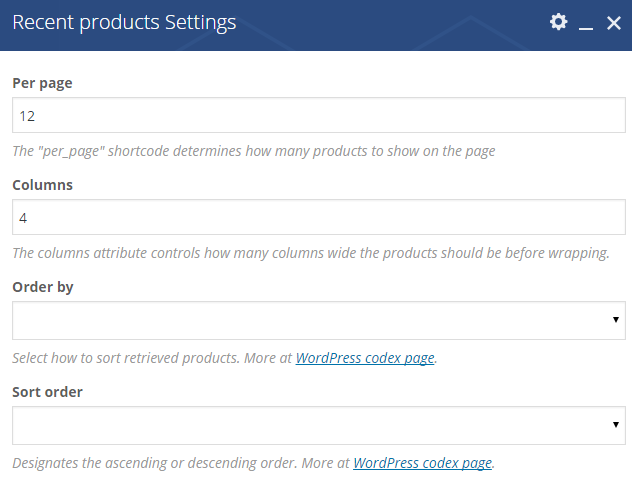 That means if you make any adjustments in a category certain page, it will overwrite options in Theme Options. 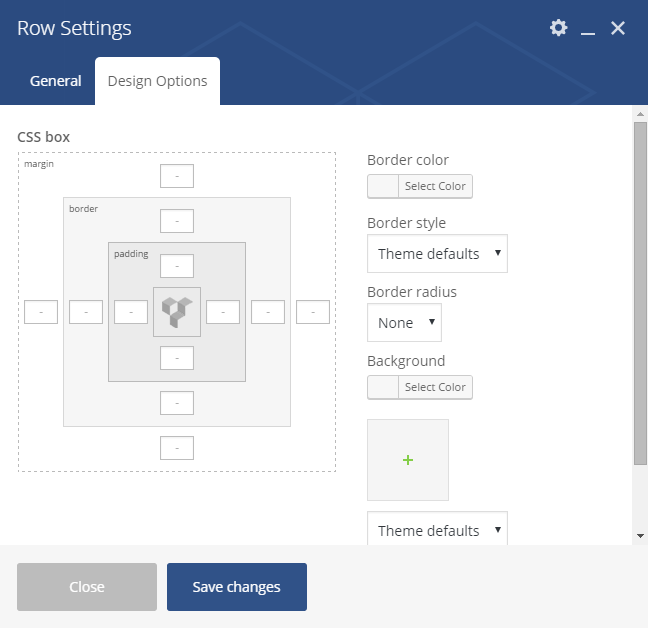 Step 1: Navigate to Appearance >>> Theme Options >>>Blog. Blog style: There are 4 styles icluding large, grid, masonry, medium. Animation type: Select any animation type you want to. 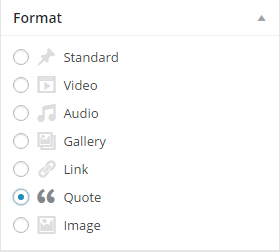 NOTE: Similar to the 'Blog' section, all the changes that have been made in this 'Single' section of Theme Options will effect the entire website. 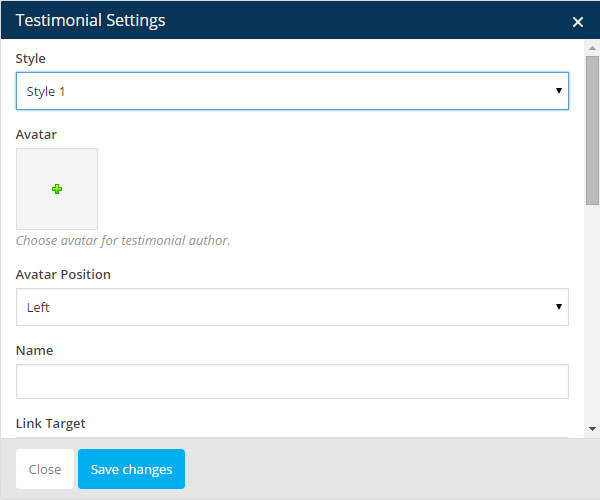 That means if you make any adjustments in a certain page, it will overwrite options in Theme Options. Step 1: Navigate to Appearance >>> Theme Options >>>Single. 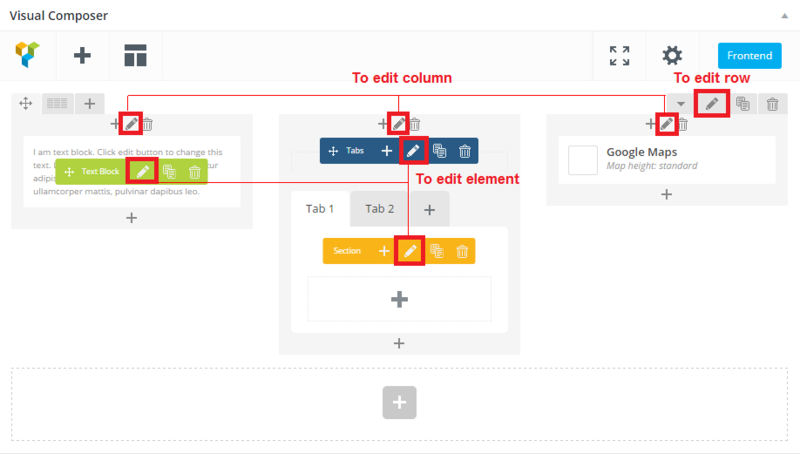 Step 2: Select single layout such as right sidebar, left sidebar or no sidebar. Right sidebar will be selected by default. 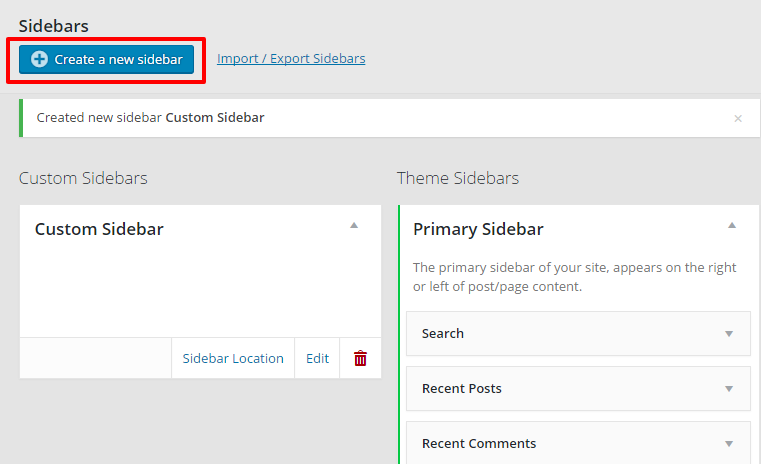 Single custom sidebar: Enter the name of sidebar you have created in Appearance >>> Widgets. For example, "secondary-sidebar"
Related post title: Fill in the name of related posts, for example "You may also like"
Number of related post: Fill in the number of related posts you want to show, for example "3". In case you want to show all related posts, you enter "-1"
You can enter 404 Title, custom text, upload 404 image you want to show when users go to 404 page. Check ON to display subcribe newsletter form. But you need to install newsletter plugin. Step 1: Navigate to Appearance >>> Theme Options >>>Social. Step 2: Social Tab in Theme Options is where you will insert your custom social media links you want to display. If you want to display Facebook icon, Twitter icon or Google+ icon in header or footer you need to insert the URL of your Facebook, Twitter, Google+ in the corresponding field. 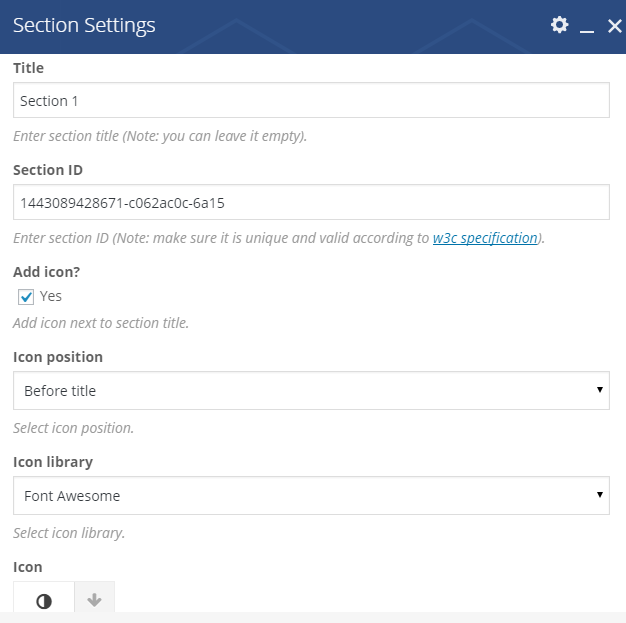 Step 3: To display icon title when you hover icons, you only need to turn On in the icon title field. 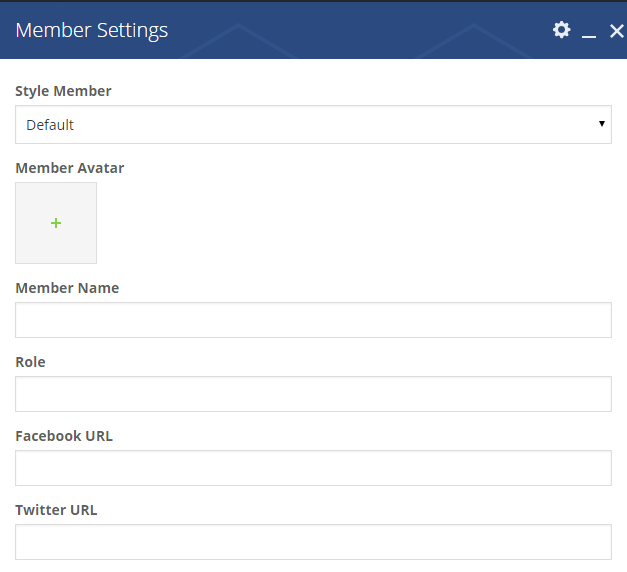 Step 1: Navigate to Appearance >>> Theme Options >>>Social share. Page background image: Allow you to upload the image as page background one. 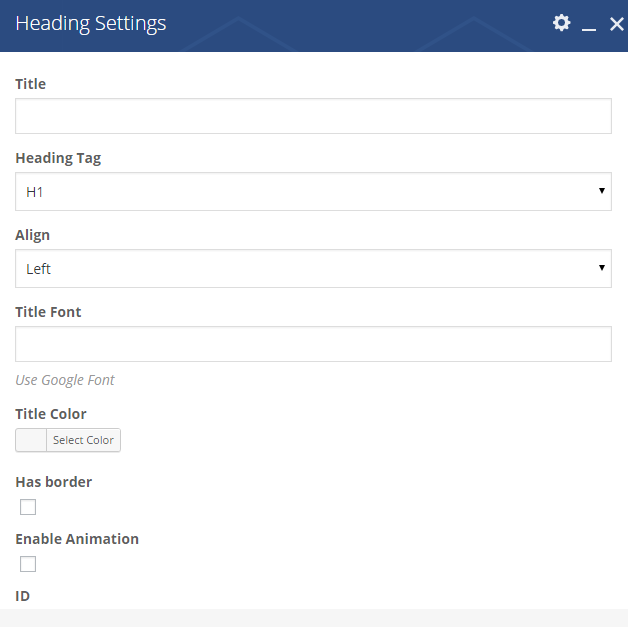 Header style: Allow you to select header style for your page. Title bar: Show or hide title bar. Default is show. Titlebar layout: Choose from justify or center for alignment of elements on titlebar. Titlebar font size: Set the size of your text in title area. Top Padding and Bottom Padding: It is a line at the top or bottom of your title area, which is different from padding of content. Background image: select image from "Media" or your computer. The size of image should be 1920x300px. Set your background image position among 9 available positions. Background image position: set the position of image background from position list. Default is left top. Background zoom effect: True or False. If you choose True, your background will have zoom effect. Otherwise, set False. Default is False. Background parallax: True or False. If you choose True, your background will have nice paralax effect in title bar. Clipmask opacity: This is the setting to adjust opacity of clipmask, an effect cleaves scope of title into small squares. Custom title content: You can create your content for title area instead of filling the title name above, which is the same as customizing post content: you can add image, media or using shortcodes. 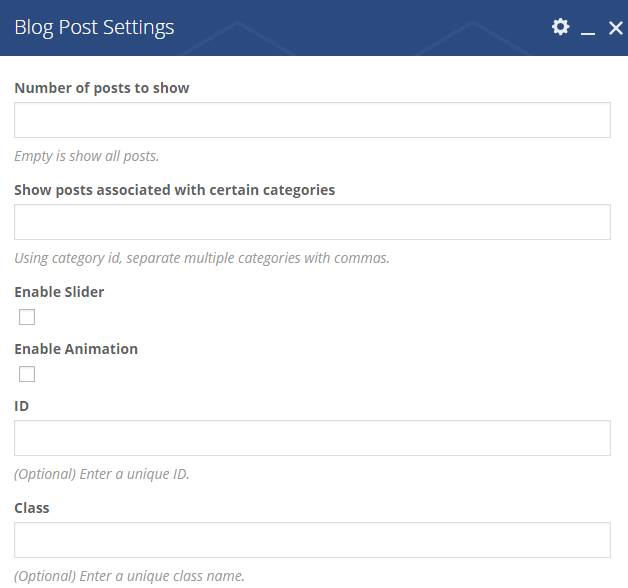 You can select a specific category of posts for page. 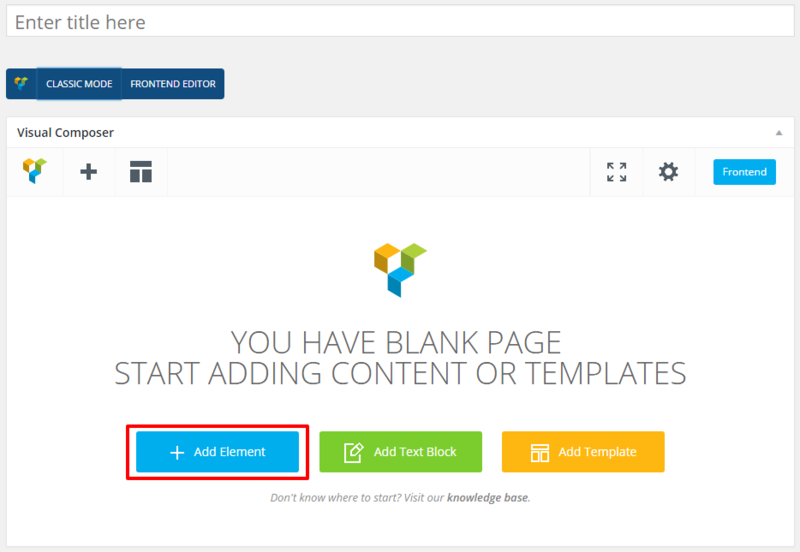 This feature only supports for blog page template. Besides, you can show/hide blog filter. Character name: The name of character. Character avatar: FYou can upload the avatar for character. 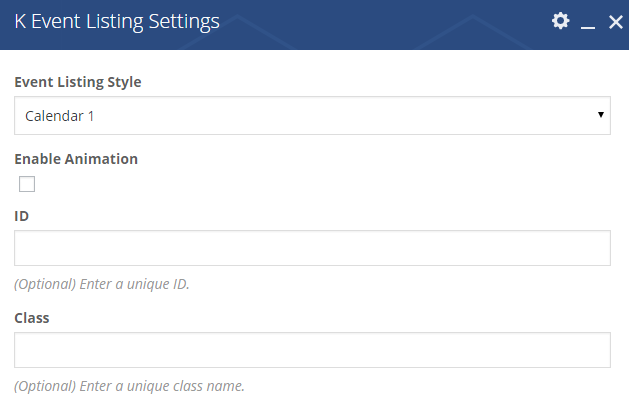 Single post style: You can use global setting or select one of 02 single styles. Single post layout: Right sidebar left sidebar or no sidebar. Link: insert soundcloud link, or link audio from other websites (option for format "Link" only, please fill in full http:// address). 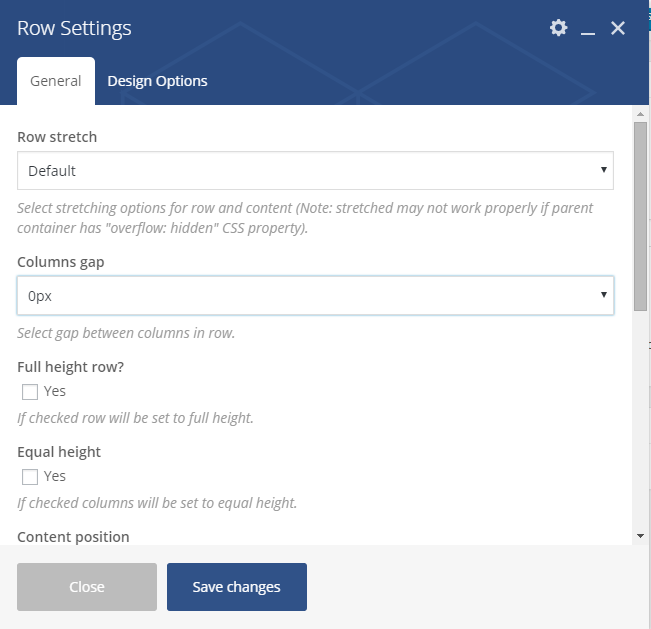 Row stretch: How to make full width or full height row? Note: If WordPress theme uses overflow:hidden in markup it may result in inappropriate row stretching. Columns gap: The gap will be introduced between all columns within this row. Default value of gap is set to 0. Equal height row: If checked columns will be set to equal height. 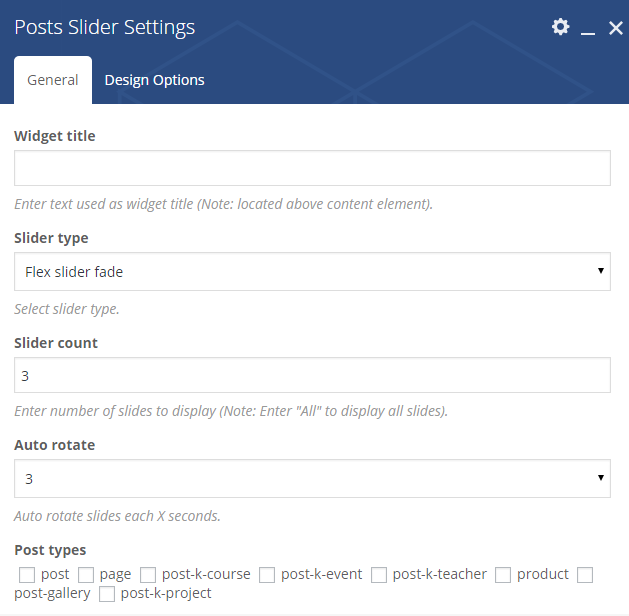 Visual Composer is a very modern and useful feature of Express, it allows users to make a new page in a short time, simplifying shortcodes. If you like the traditional way to create your own page, you can always click to Classic Mode. It is very easy to create your own page. Create a very new page by yourself, choose "Add element" to insert any rows, texts or shortcodes you want to show on your page or "Add text blog" to write text. Create new page based on available layouts: Landing page, Call to action page, feature list, description page, product page or service list. Step 2: To custom each row, you choose options in the right of the row. Css: padding, border and margin. Color: color of border and background. Choose color from color palette. Theme_border: select theme from theme list: solid, dotted, dash, none.... Default is theme defaults. Theme_background: select theme from theme list: cover, contain, no repeat, repeat. Default is theme defaults. 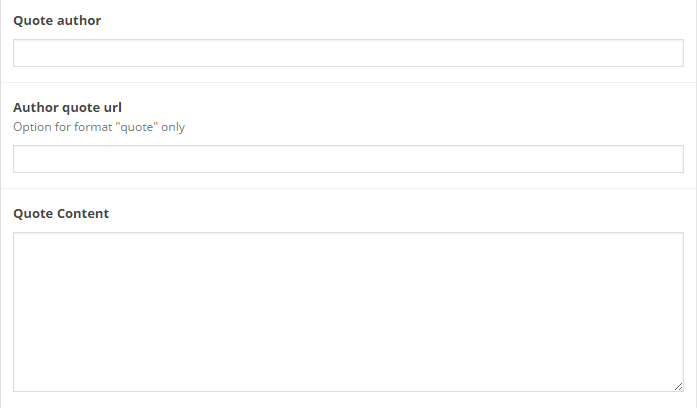 Box_controls: tick the checkbox if you want to simplify controls. Otherwise, deselect it. 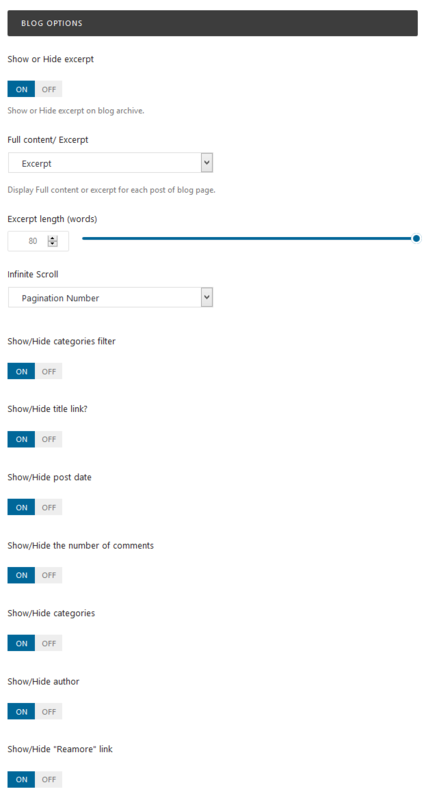 Row_fullwidth: tick the checkbox if you want the row to have full width (no wrap content). Otherwise, deselect it. Color" color of background. Choose color from color palette. ID: enter a unique ID for your button. 2.2. Clone: make a clone from original element. 2.3. Delete: delete the element. Step 3: Each element you choose will have different setting. The below is detail setting for each shortcode. Button_text text you want to show inside the button. Link: the URL that the button should link to. Choose icon: choose an icon from the icon set. Button Style: There are 03 styles of button for you to choose which are Default button, Outline button and Around button. Button color: There are different colors of button for you to choose. Size: Button Size. You can choose among Small, Medium and Large. Default is small. Align: You can change the alignment of button with options such as Left, Right or Center. Default is left. Fullwidth: tick the checkbox if you want the button to have fullwidth. Otherwise, deselect it. 3D: tick the checkbox if you want the button to be 3D. Otherwise, deselect it. Transparent: tick the checkbox if you want the button to be transparent. Otherwise, deselect it. Animation: tick the checkbox if you want to enable animation, then select kind of animation and fill animation time delay. Otherwise, deselect it. Button_name: You will fill in the name of button. Link to: the URL that the button should link to. Icon hover: choose an icon from the icon set. Button background color: You can select any custom color for button. Enable Animation: tick the checkbox if you want to enable animation, then select kind of animation and fill animation time delay. Otherwise, deselect it. Percent: should be a number from 0 – 100. Color: Color of the progress, background and text. You can choose any color from color palette. Height: the height of progess bar. 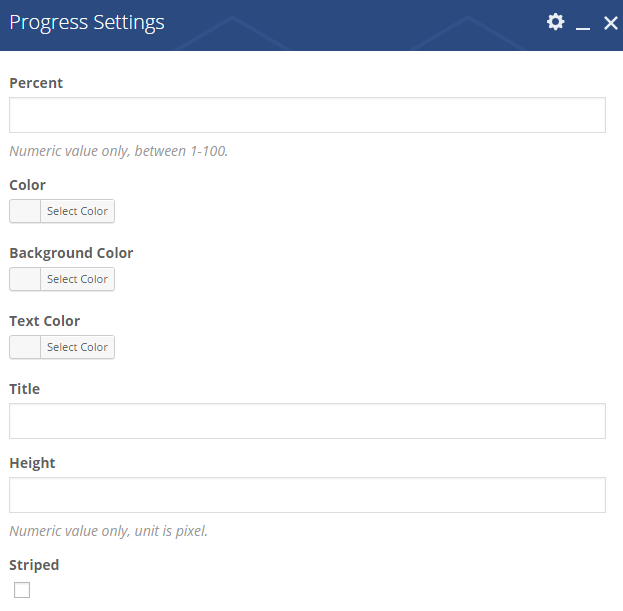 Striped: tick the checkbox if you want your progress to be striped. Otherwise, deselect it. ID: enter a unique ID for your step. Class: enter a unique class name for your step. Widget Title: Enter text used as widget title, located above content element. Value: This should be a number from 0 – 100. Label Value: Enter label for pie chart and you can leave it empty and then it will automatically take value from "Value: field. Unit: Enter measurement units (Example: %, px, points, etc. And graph value and units will be appended to graph title. Color: color of outer, tracking part, text and text background. You can choose any color from color palette. Default is the primary color. Icon library: You can these icon from font awesome, open iconic, typicons, entypo, linecons. Icon: an icon from the icon set. Color: selecting color for icons from colors that is available. Background style: that can be square, rounded or circle . Size: Size of icons can be normal, mini, small, large, extra large. Icon alignment: You can place icons to be left, right or center. URL (link): You can click to select URL and fill in the icon URL and title you want. CSS animation: To show animation, you can choose some styles that is available. Layout: select layout for your icon box: 1, 2 or 3. Default is 1. Color: Color of background icon box. Title: title/name of the iconbox. Title link to: Fill in blank with name of link. Permalink url only. Title Font size: Size of font title. Numeric value only. Unit is pixel. Text transform: Tranformation of text: inherit, uppercase, lowercase, initial and capitalize. Title Color: The color of title. Sub_title: Sub title that you want to show below Title. Title Margin Bottom: This is where you custom the title margin at the bottom. Numeric value only. Unit is Pixel. Icon Type: Choose icon type: Icon fonts or Graphics. Choose Icon: There are more than 200 icons for you to choose. Click on the "+" button to choose. Icon Size: Choose size for icon. Numeric value only. Unit is pixel. Icon color: Choose color for icon. Link to: Add the link for icon. Link Text: Text for that link. Content: Add your content in this icon box. Margin: margin of top, right, bottom and left. Numeric value only. Unit is pixel. 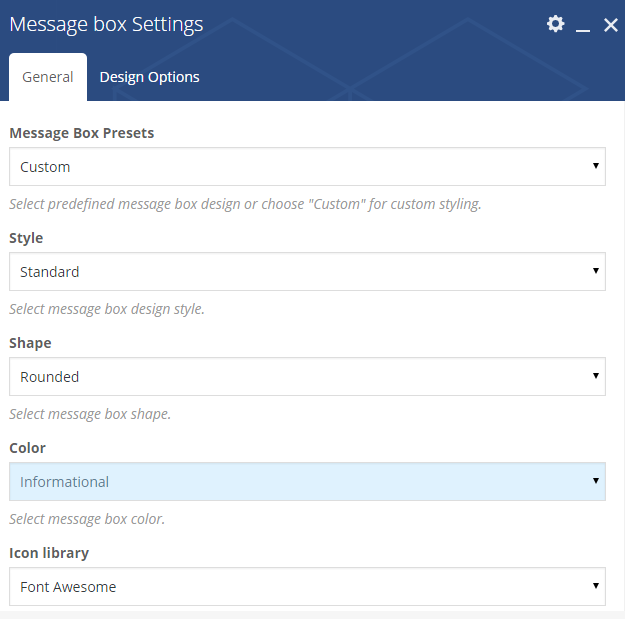 Mesage Box Presets: You can choose Custom and continue to make changes with all the below fields. If not, you can select other options. Style: select the style for your message: solid, solid icon, outline, 3D. Shape: select the shape for your message: rounded, square, round. Color: there are different colors for you to choose. Text: content you want to show inside message box. You can insert image or audio too. Transparent: tick the checkbox if you want background to be transparent. Otherwise, deselect it. Close: tick the checkbox if you want message box is close. Otherwise, deselect it. Heading_tag: h1, h2, h3, h4, h5 or h6. Default is h1. Align: Heading align: left, center or right. Default is left. Title Font: Use any font from Google Font. Title Color: Choose color for heading. 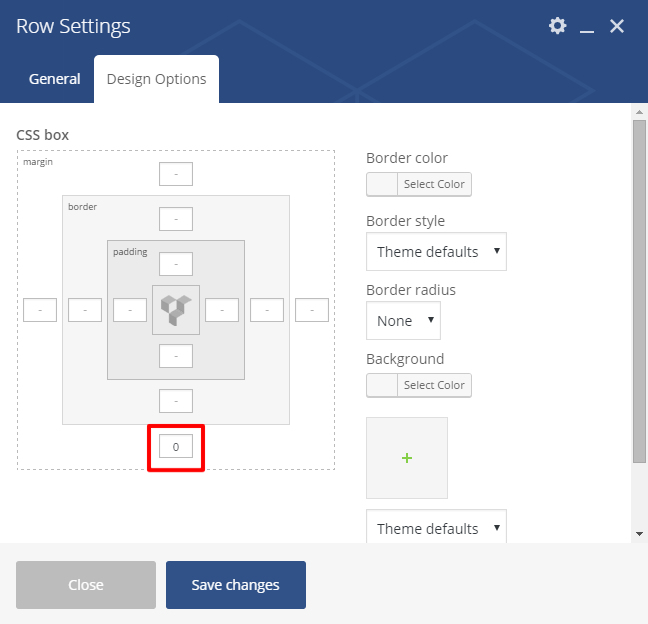 Border: tick the checkbox if you want the heading to have border and then select type of border: short line, bottom icon, heading, boxed heading, bottom border, line through, dotted line, double line or fat line. Otherwise, deselect it. Seperated: True or False to seperate/link among all the tables. You can choose style 1 or style 2 for carousel. 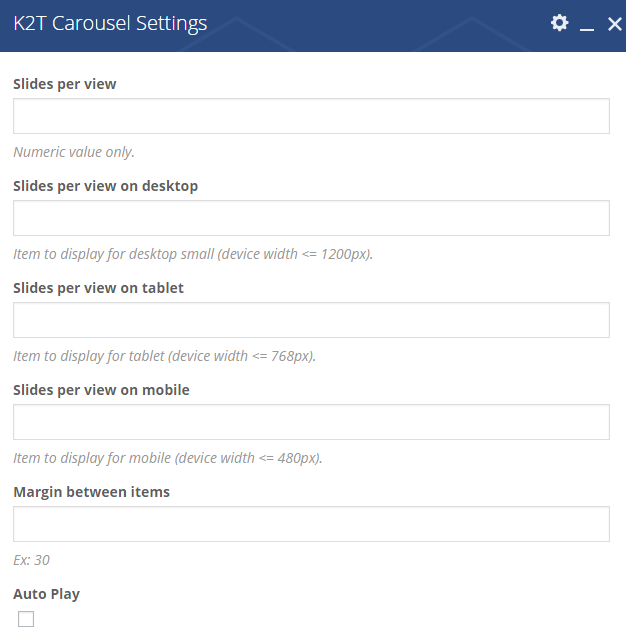 After that, selecting small elements for carousel such as single iamge, raw HTML code, testimonials or events. Slides_per_view: number of slides per view. Numeric value only. Slides_per_view_on_desktop: number of slides per view can display on desktop. Item to display for desktop small (device width <= 1200px). Slides_per_view_on_tablet: number of slides per view can display on tablet. Item to display for tablet (device width <= 768px). Slides_per_view_on_mobile: number of slides per view can display on mobile. Item to display for tablet (device width <= 480px). Margin between items: Enter the margin measurement between the items. Unit is pixel. Enter a number only. 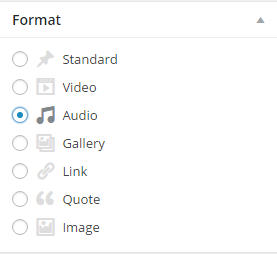 Auto_play: tick the checkbox if you want slide auto play. Otherwise, deselect it. Navigation: tick the checkbox if you want show navigation. Otherwise, deselect it. Pagination: tick the checkbox if you want show pagination, then select position of pagination: inside, top or bottom. Otherwise, deselect it. Class: choose a unique class name for your carousel. Event Listing Style: You can choose the listing style with Calendar (2 styles, or Grid, Carousel, Classic. Enable Animation: Tick the checkbox to enable animation. Widget_title: Enter text which will be used as widget title. Leave blank if no title is needed. Style: 02 options for you, which are Round and square shape. Color: Different colors for you to select. Select tab colors. Do not fill content area: If you don't want to fill the content area with colors, tick the checkbox. Spacing: Select tabs spacing. Unit is pixel. Gap: Select the gabs between tabs. You can choose none or fill in the measurement. Unit is pixel. Position: Top or Bottom is 02 options for you to select. Alignment: Select the tab of Left, Center, Right sections to change the title alignment. 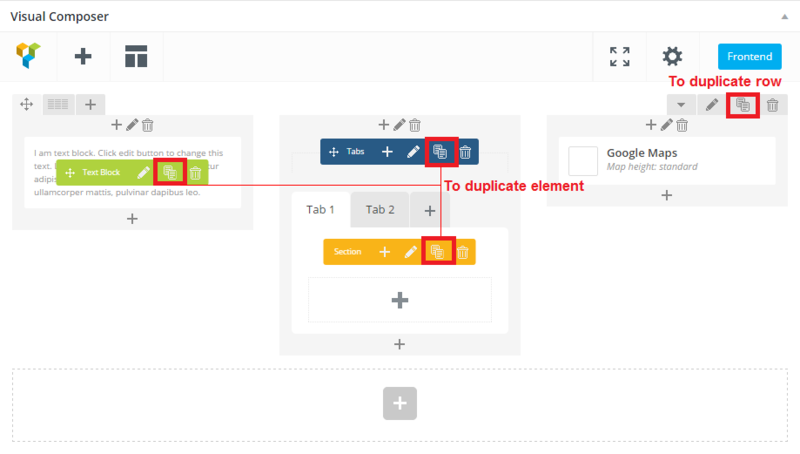 Autoplay:Select auto rotate for tabs in seconds (Note: disabled by default). Active section: Enter active section number (Note: to have all sections closed on initial load enter non-existing number). 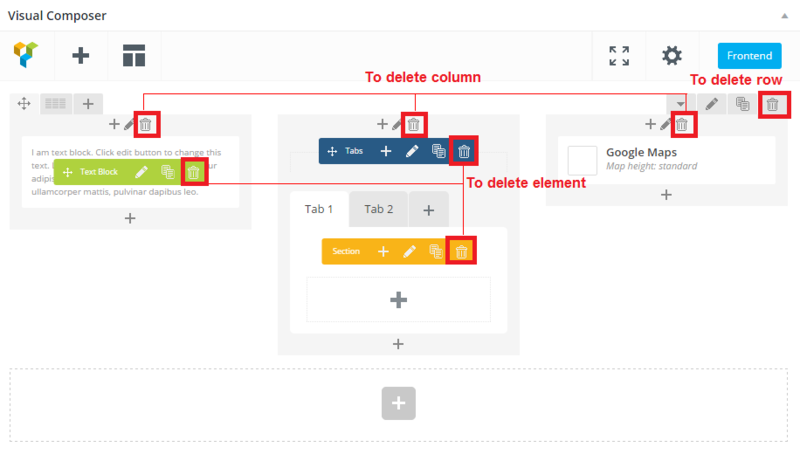 Pagination Style: choose pagination style by selecting the tabs of different layouts. Extra class name:If you wish to style particular content element differently, then use this field to add a class name and then refer to it in your css file. Style: select Style 1, Style 2 or Style 3. Default is style 1. Avatar: choose avatar for testimonial author from library media. Avatar_position: left, center or right. Name: name of testimonial author. Position: position of testimonial author. Link to: fill any URL you want. Link_target: open in a new window or open in the same frame as it was clicked. Text: you can add text or image, audio... from library media. Animation: tick the checkbox if you want to have animation on your page. Otherwise, deselect it. Widget title: enter text which will be used as widget title. Leave blank if no title is needed. Image: select image from media library. Image_size: enter image size. 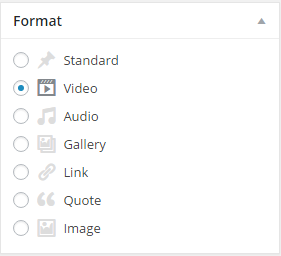 Example: "thumbnail", "medium", "large", "full" or other sizes defined by current theme. Alternatively enter image size in pixels: 200x100 (Width x Height). Leave empty to use "thumbnail" size. Image_alignment: select image alignment: align left, align center or align right. Image_link: enter URL if you want this image to have a link. Image_style: select image style: rounded, outline, shadow or border. Default is none. Image_hover_style: select image hover style: dark, light or banner. Default is none. Dropdown Style: Square, square fill color, circle, circle fill color or solid. Year, Month, Day, Hour, Minute, Second: fill in the blank the word of year, month, day, hour, minute and second in your language. Align: left, center or right. Color: color of number and background. Choose color from color palette. Data source: You can select source that is available. Narrow data source: That means you will fill in specific categories, tags or custom taxonomies. Total items: set maximum posts in grid or enter -1 to show all. Display style: select one of the styles: all, load more button, lazy loading, pagination. Show filter: Check to box to enable. 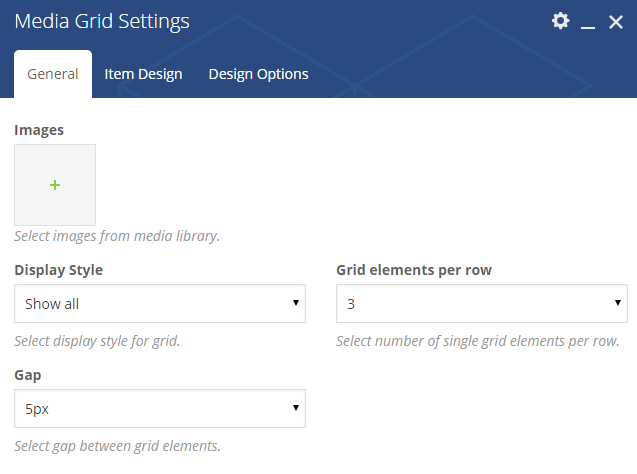 Grid elements per row: select the number of single grid elements per row. Gap: Distance between grid elements. Offset: The number of grid elements to displace or pass over.. Exclude: Fill in the name of posts or pages you want to exclude. The element template: Default is basic grid, besides there are still a lot of templates. Number_of_post_to_show: number of posts you want to show. Empty is show all posts. Show_posts_associated_with_certain_categories: Using category id, separate multiple categories with commas. Address: the place you want to mark. Marker: choose Yes or No. Yes to display marker. Marker_image: to change default Marker. Traffic: tick the checkbox if you want to show traffic on the map. Otherwise, deselect it. 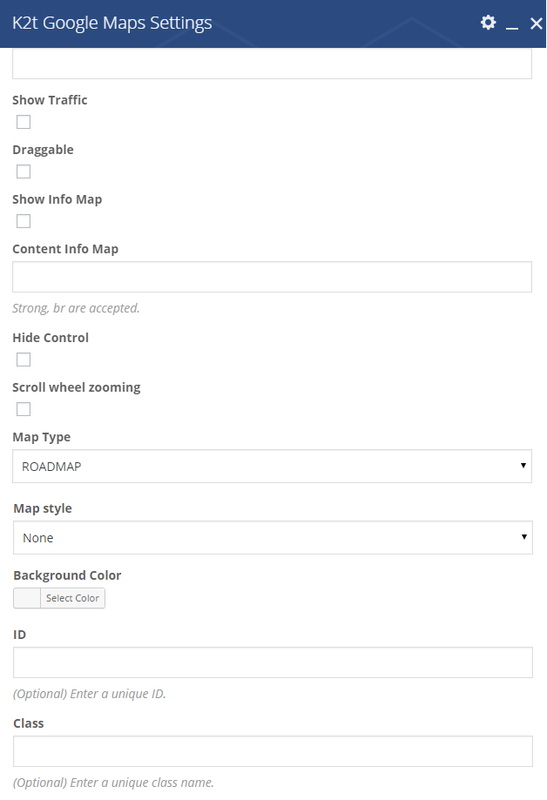 Draggable: tick the checkbox if you want to drag the map. Otherwise, deselect it. Show_Info_Map: tick the checkbox if you want to show info map. Then fill information in the Content Info Map. Strong, br are accepted. Otherwise, deselect it. Maptype: the type of Google Maps: Roadmap, Satellite, Hybrid, Terrain. Hide_control: tick the checkbox if you want to show control on the map. Otherwise, deselect it. Scroll_wheel_zooming: tick the checkbox if you want to scroll wheel zooming. Otherwise, deselect it. Map_type: select type of map: Road map, Satellite, Hybrid or Terrain. Color: Select color of background from pallete. Column: select column display brand (from 1-8). Padding: if you select true, it will be padding between item. Grayscale: tick the checkbox to display grayscale..
Tooltip: tick the checkbox to enable tooltip. Animation: tick the checkbox to enable animation, then choose style of animation and time delay (numeric value only, 1000 = 1sec). Style: select style 1, 2, 3 or 4. Link: fill link of Facebook, Twitter, Skype, Pinterest, Instagram, Dribble and Google Plus. Style: select style 1 or 2. Align: Select align: left, center or right. Author: fill author name of the quote. Select shortcode Icon list, then choose small Icon inside Icon list. Icon: select icon from icon list. Color: select color of all of icon in icon list. Content: content of icon you wan to show. Widget_title: Enter text which will be used as widget title. Leave blank if no title is needed..
Link: Link to the video. 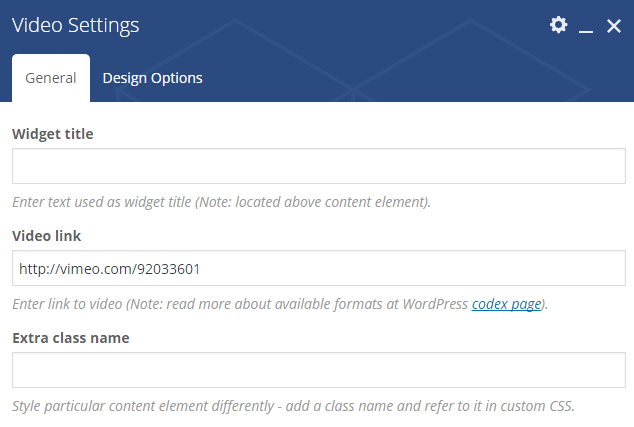 More about supported formats at WordPress codex page. Extra_class_name: if you wish to style particular content element differently, then use this field to add a class name and then refer to it in your css file. To increase interact between you and your visitors, Express has 4 different popular social buttons for you to choose: facebook, twitter, google plus and pinterest. 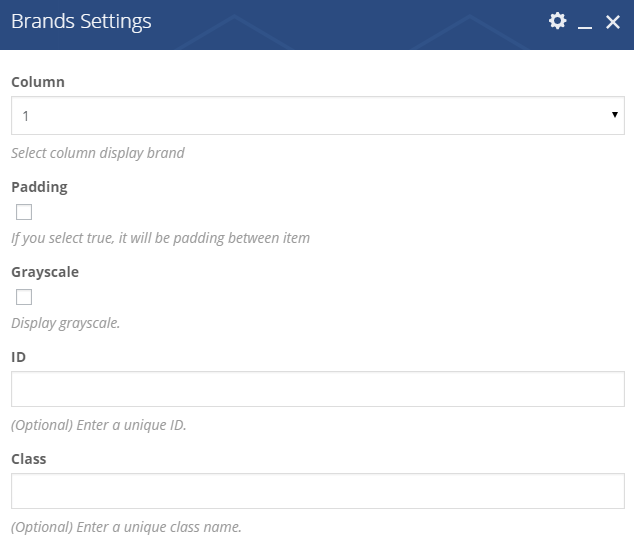 Facebook: select type: Horizontal, Horizontal with count and Vertical with count. Twitter: select type: horizontal, vertical with count and horizontal with count. Google Plus: select button size: standard, small, medium or tall. And select type of annotation: inline, bubble, none. Pinterest: select type: horizontal, vertical or no count. Title: title of form. Leave blank if no title is needed. 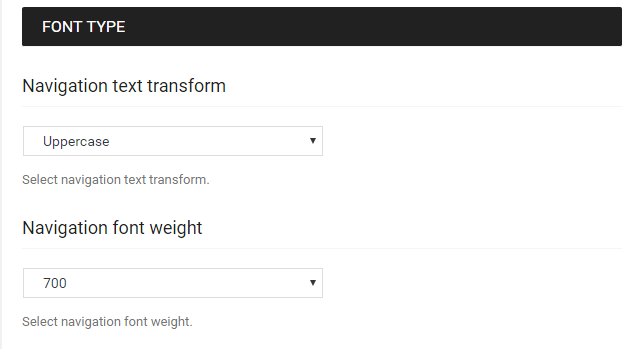 Contact_form: Choose previously created contact form from the drop down list. Widget title: Enter text used as widget title (Note: located above content element). Title: title of accordion item. Leave blank if no title is needed. Section ID: Enter section ID (Note: make sure it is unique and valid according to w3c specification). Icon: tick the checkbox if you want to add icon from icon list. Icon position: It can be after or before title. Text: enter text of accordion item. Class: If you wish to style particular content element differently, then use this field to add a class name and then refer to it in your css file. Title: title of toggle block. Leave blank if no title is needed. Content: enter text of media (audio, image...). Style: select style for toggle: default, simple, round, round outlline, rounded, rounded outline, square, quare outline, arrow or only text. Color: select color of icon. Size: select size of toggle: small, normal or large. State: state of toggle: closed or open. Animation: tick the checkbox to enable animation. Otherwise, deselect it. Images: Select images from media library. Size: the size of image. Leave empty to use "thumbnail" size. On click: what to do when slide is clicked. Slider mode: Horizontal or vertical. Slider speed: duration of animation between slides. Slides per view: the number of slides you want to display. Display Style: Choose show all, load more button, lazy loading, pagination. Grid elements per row: the number of single grid elements per row. Type: select gallery type: Flex slider fade, flex slider slide, nivo slider or image grid. Images: select select images from media library. Size: Enter image size. Example: thumbnail, medium, large, full or other sizes defined by current theme. Alternatively enter image size in pixels: 200x100 (Width x Height). Leave empty to use "thumbnail" size. On_click: define action for onclick event if needed: open pretty photo, do nothing or open custom link. Slider Type: Select Slider type that you like such as Flex Slider with fade effect, Flex slider and Nivo slider type. Slider Count: Enter number of slides to display (Note: Enter "All" to display all slides). Auto Rotate: Auto rotate slides each X seconds. 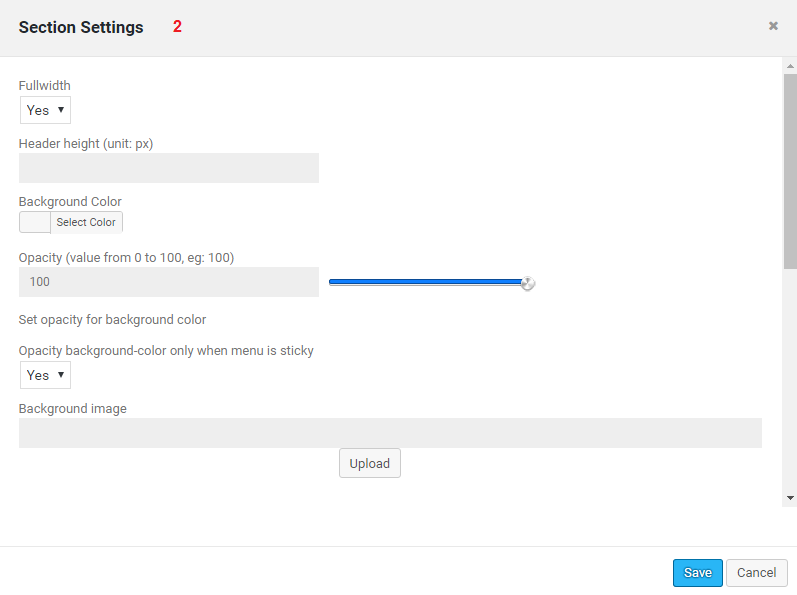 Post types: Select source for slider. Description: Select source to use for description (Note: some sliders do not support it). You can choose No description, or Teaser (Excerpt). Link: Link Types which are Link to Post, Link to bigger iamge, open custom links. You can also set it with no links. Thumbnail size: Enter thumbnail size. Example: thumbnail, medium, large, full or other sizes defined by current theme. Alternatively enter image size in pixels: 200x100 (Width x Height). 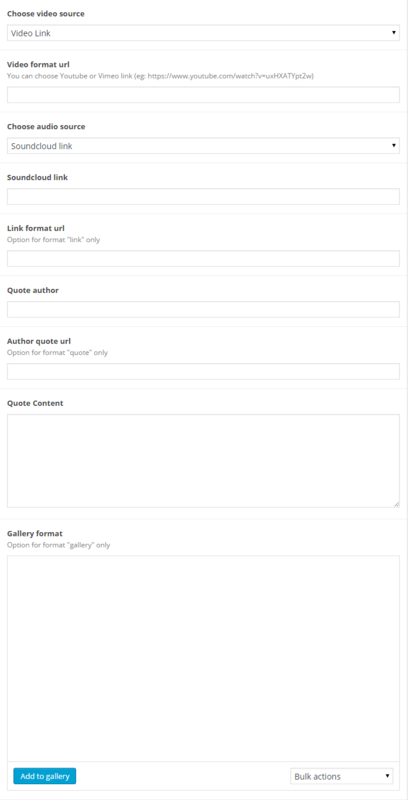 Post/Page IDs: Enter page/posts IDs to display only those records (Note: separate values by commas (,)). 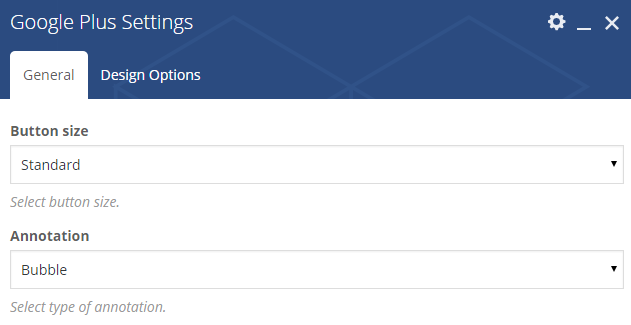 Use this field in conjunction with "Post types" field. Categories: Enter categories by names to narrow output (Note: only listed categories will be displayed, divide categories with linebreak (Enter)). Sort order: You can choose Descending, Ascending order. Heading: Enter text for heading line. You can tick the checkbox "Use Custom Font" to enable Google fonts. Sub Heading: Enter text for subheading line. 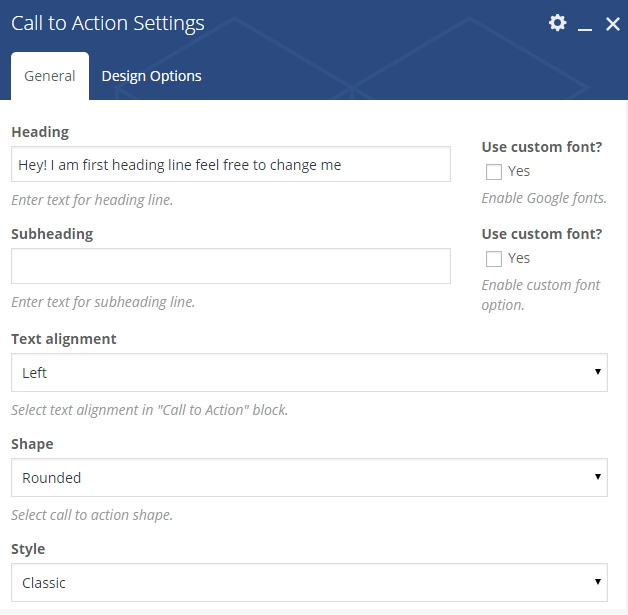 Text Alignment: Select text alignment in "Call to Action" block. You can choose Left, Right or Center and Jusstify. Shape: Select call to action shape. It can be round or square. Style: Select call to action display style. It can be Classic, Flat, Outline, 3D or Custom. Color: Select color schema by tapping the color option. Text: Insert the content you want to display. Width: Select call to action width (percentage). Add button? Add button for call to action. If you don't want, you can set it "No". Add icon? Add icon for call to action. If you don't want, you can set it "No". CSS animation Add css animation for call to action. If you don't want, you can set it "No". 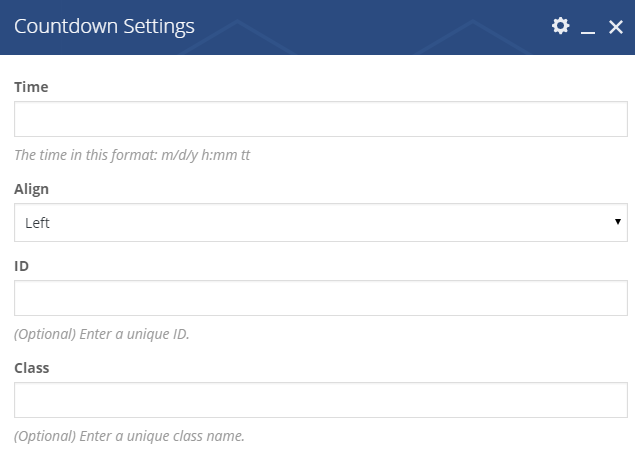 Extra Class name: enter a unique class name for your step. Column: The columns attribute controls how many columns wide the products should be before wrapping. Order by: Select how to sort retrieved products. Express comes with a Child Theme. 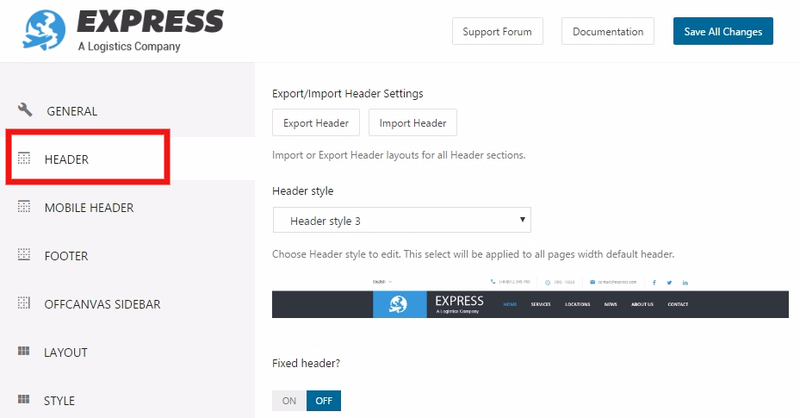 Simply install Express-Child.zip like a regular WordPress theme. 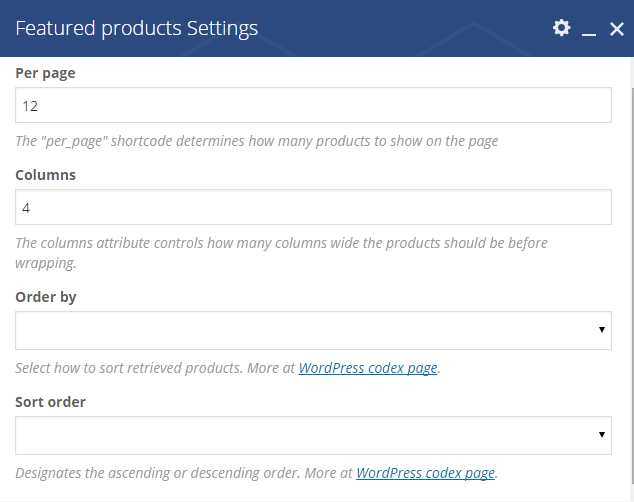 A WordPress child theme allows you to apply custom code changes to your site. 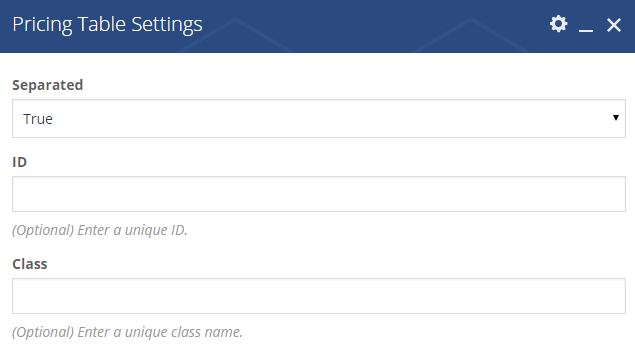 Using a child theme ensures that all your customizations will not be overwritten even when you update the parent theme. If you modify code directly from a parent theme, then update the parent theme, your changes will be lost. Always use a child theme if you are modifying core code. Step 6: Done!. See the results! 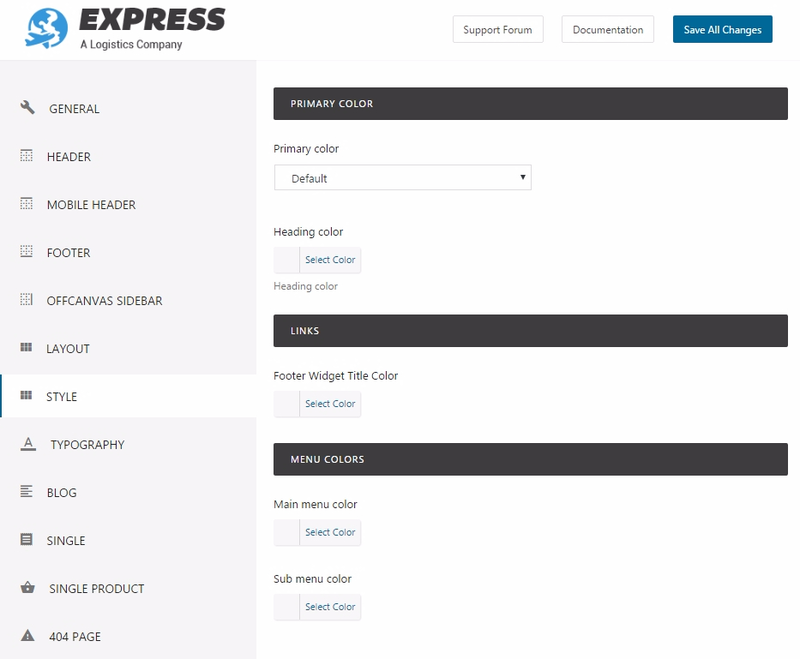 We hope you can create the best website with Express. One again, thank you so much for using Express. As i said at the beginning, i'd be glad to help you if you have any questions relating to this theme. No guarantees, but i'll do my best to assist. If you have a more general question relating to the themes. Our support covers getting setup, trouble using any features and any bug fixes that may arise. Unfortunately we cannot provide support for customizations or 3rd party plugins. If you need help with customizations of your theme, please contact with us with your requirement. Our technical team will help you with some fees. Our working time is 8:30am - 5:30pm from Monday to Friday (GMT+7). So if you email us or submit ticket besides this working time, we are really sorry that we are not able to respond you soon. We will try to reply you as fast as we can. Especially if you email or submit ticket at weekend, please be patient and we will respond to you right when we are back on Monday.